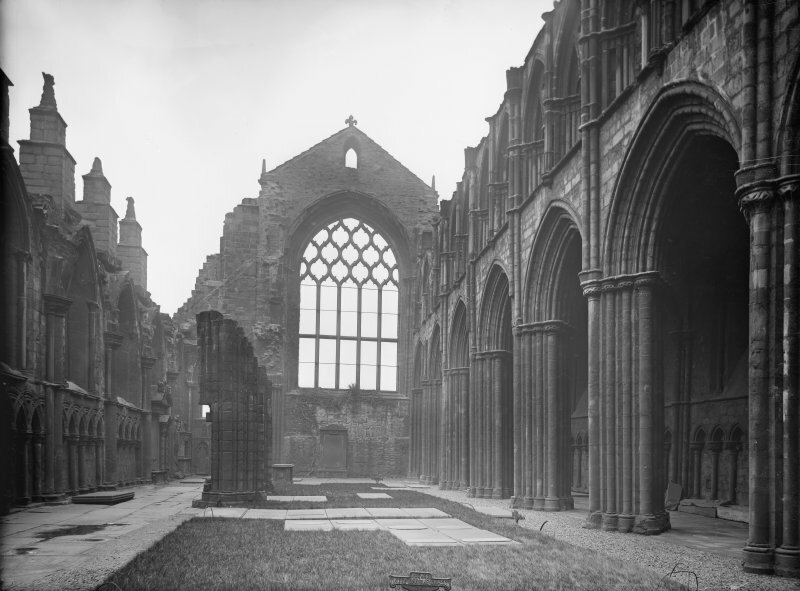 Interior Elevation of One Bay in North Aisle of Nave in Holyrood Abbey. Signed "J.W." u.d. 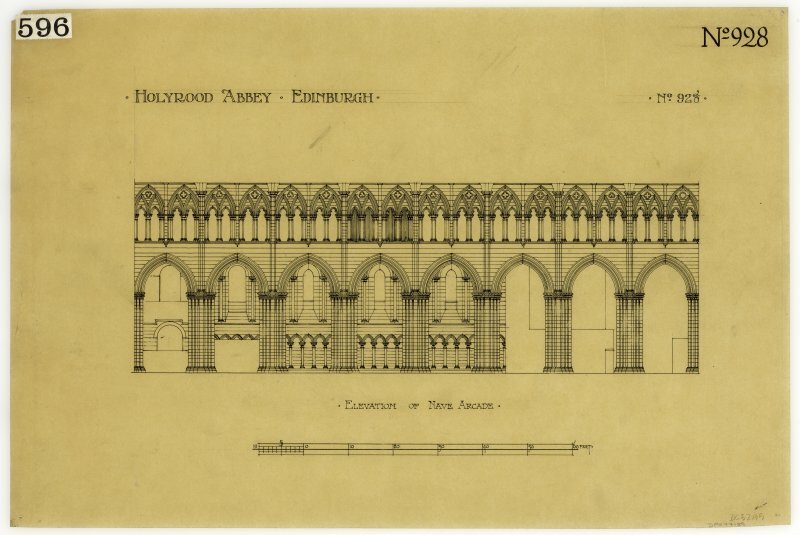 Elevations of Bays in South Aisle and Nave of Holyrood Abbey. u.s. u.d. 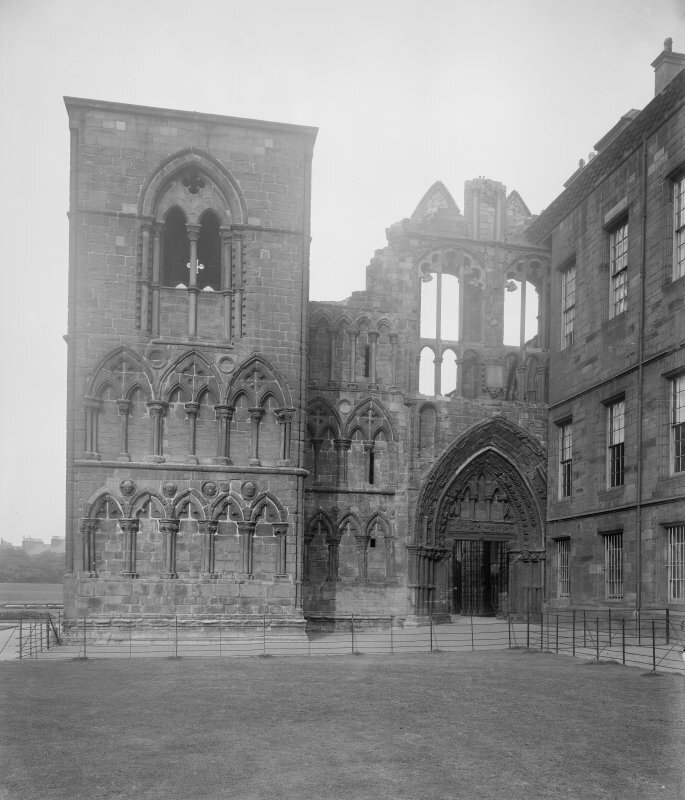 General view of West end of Holyrood Abbey (Chapel Royal) Insc. 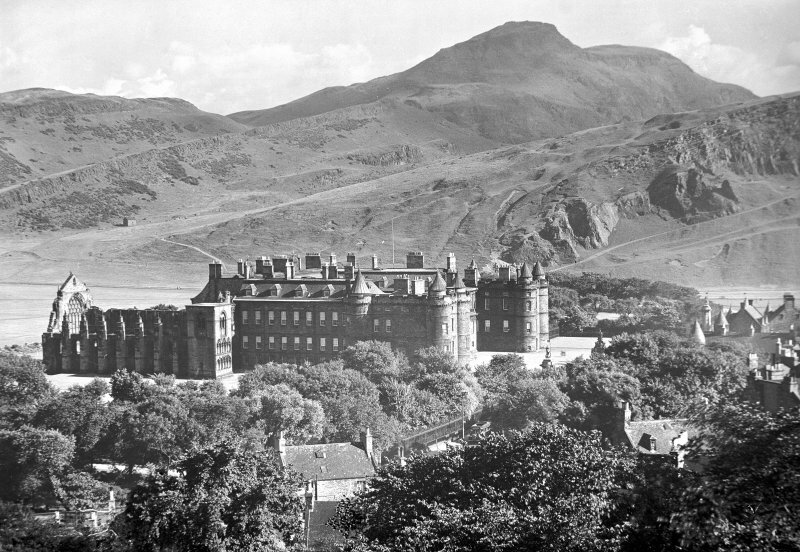 "Chapel Royal, Holyrood. 531. AI." 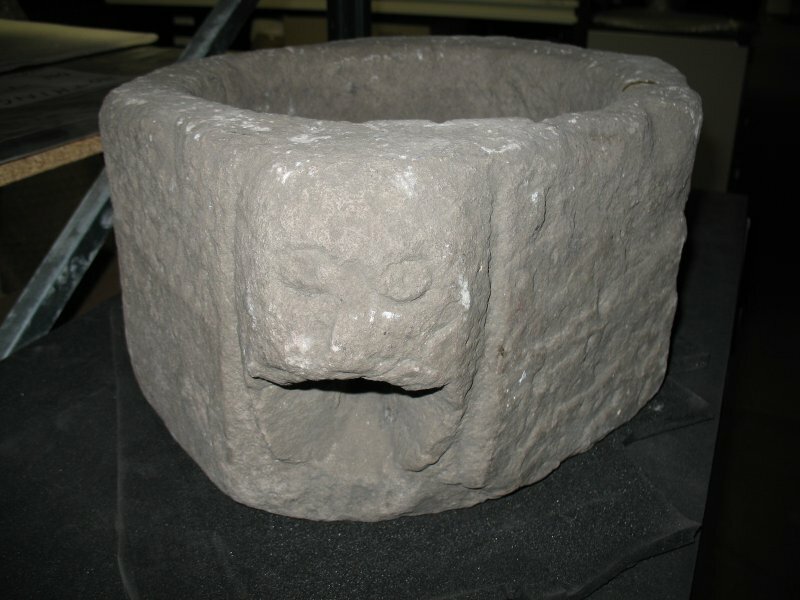 View of face mortar (previously in Holyrood Abbey, now in storage). 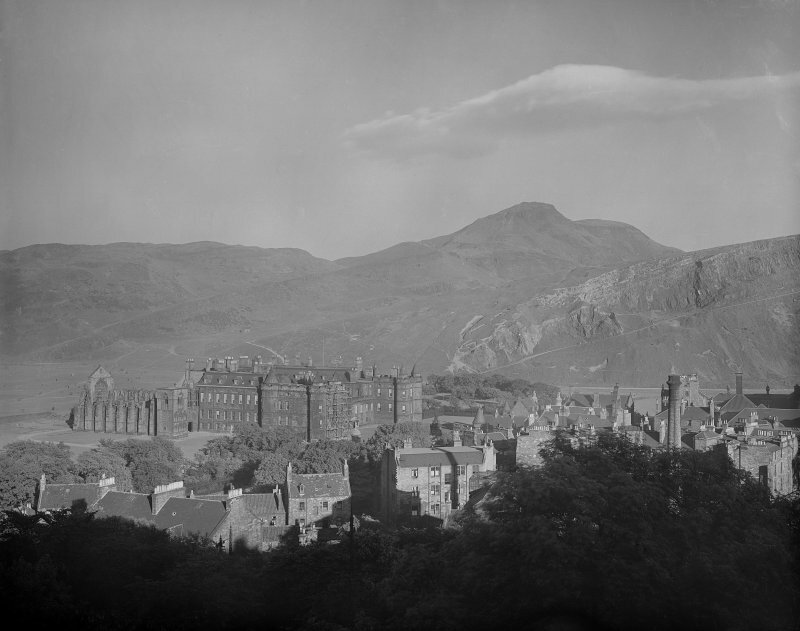 General view of Holyrood Palace and Abbey looking South. 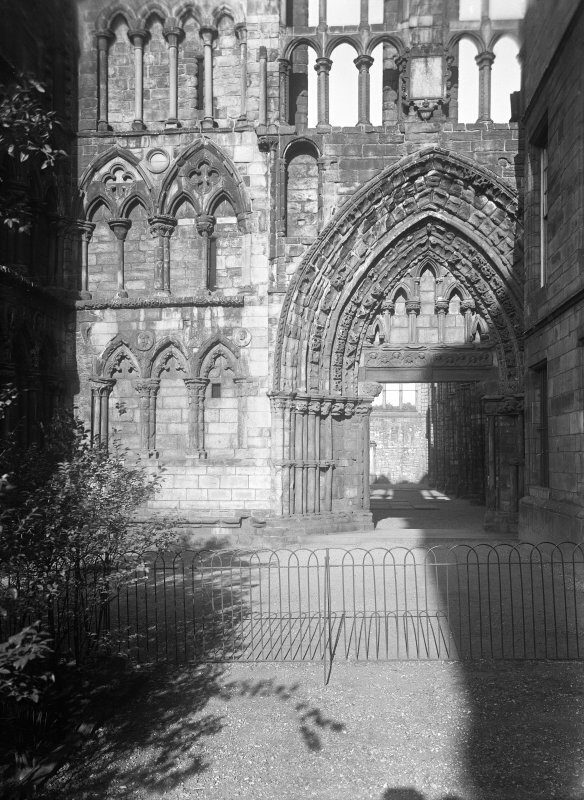 General view of East end of Nave in Holyrood Abbey Insc. 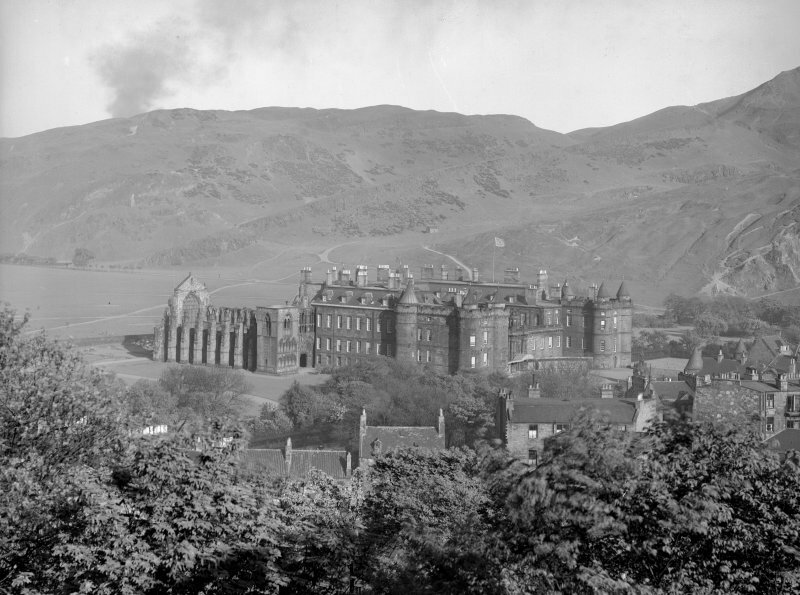 "Chapel Royal, Holyrood. 52. AI." 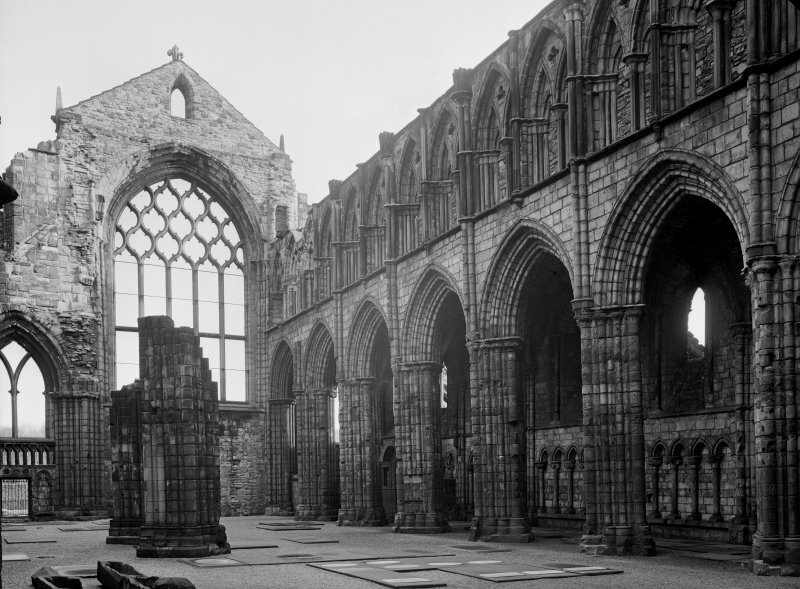 Holyrood Abbey. 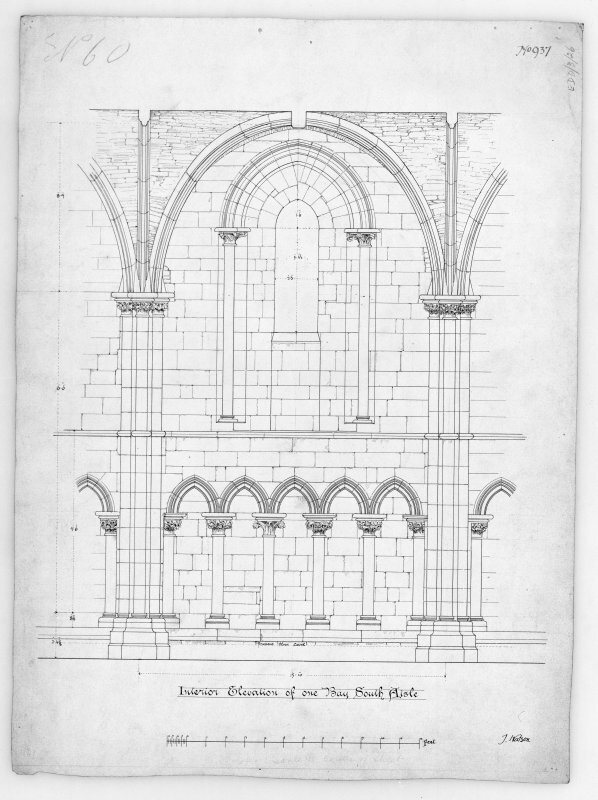 Elevation of nave arcade. 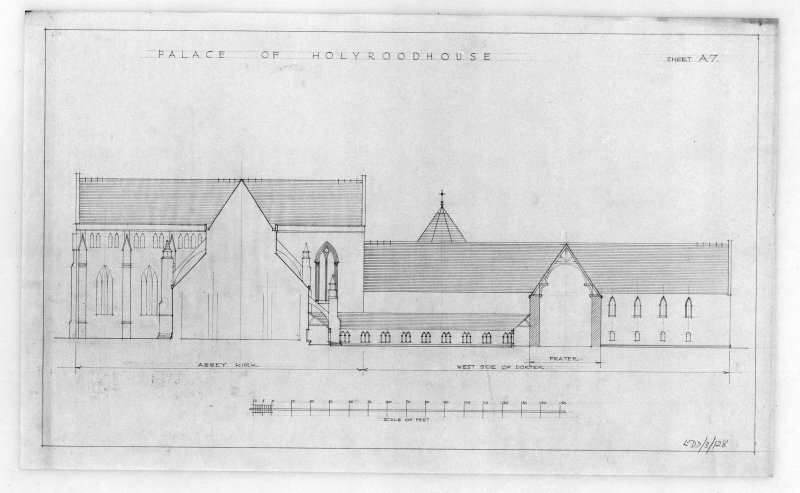 Photographic copy of proposed Restoration of East Elevation of Holyrood Abbey and Conventual Buildings u.s. u.d. 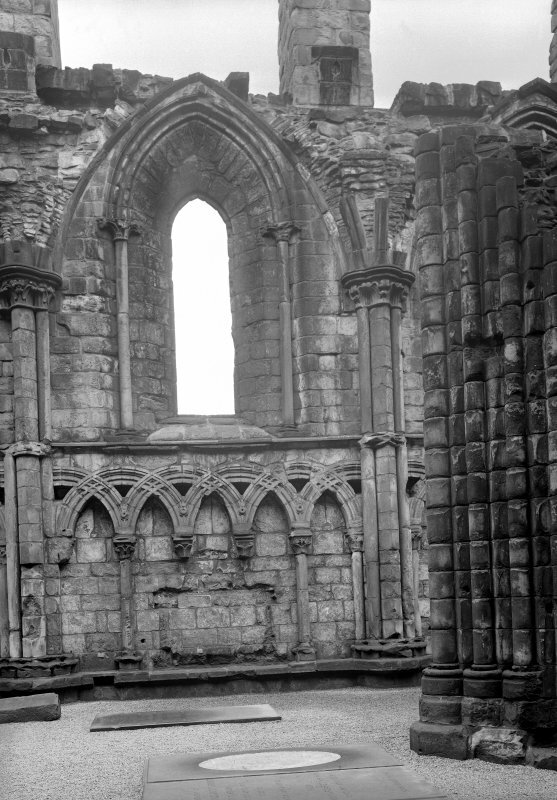 Interior Elevation of One Bay in South Aisle of Nave in Holyrood Abbey. Signed "J.Watson" u.d. 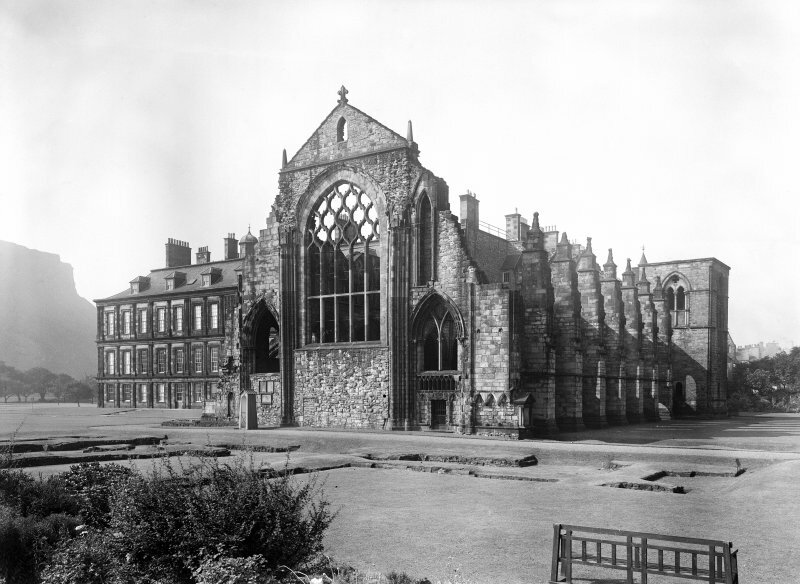 South Elevation of Nave of Holyrood Abbey. u.s. u.d. 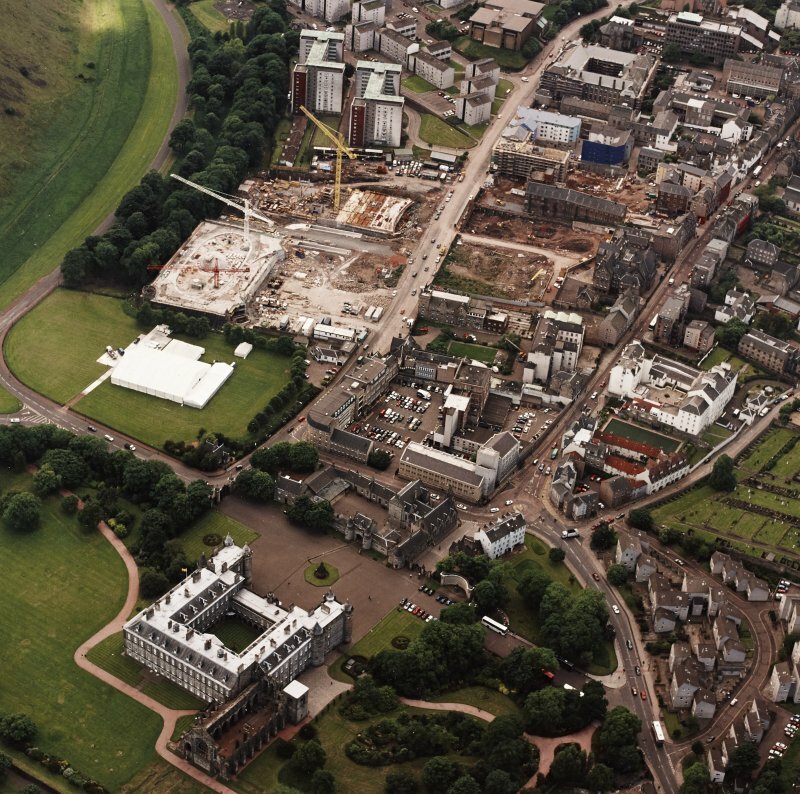 Oblique aerial view of Holyrood Palace and Holyrood Abbey, looking WNW. 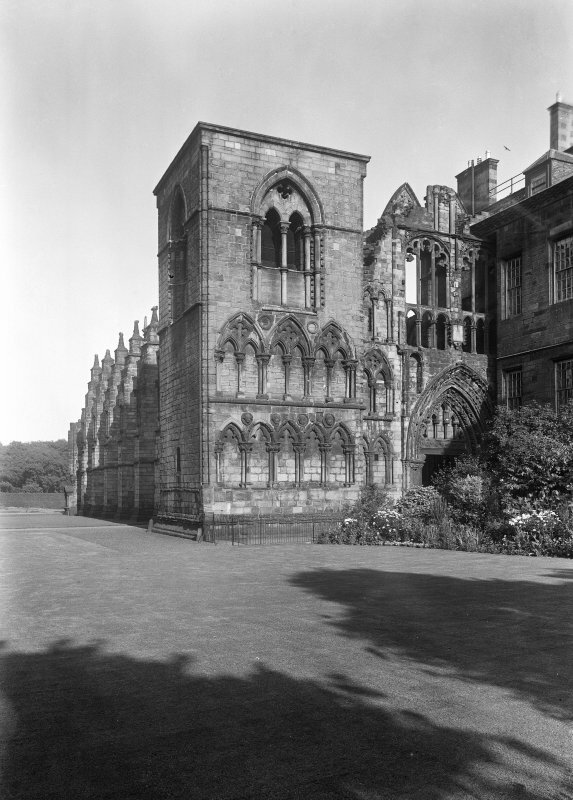 View of architecturel details on exterior of Holyrood Abbey. 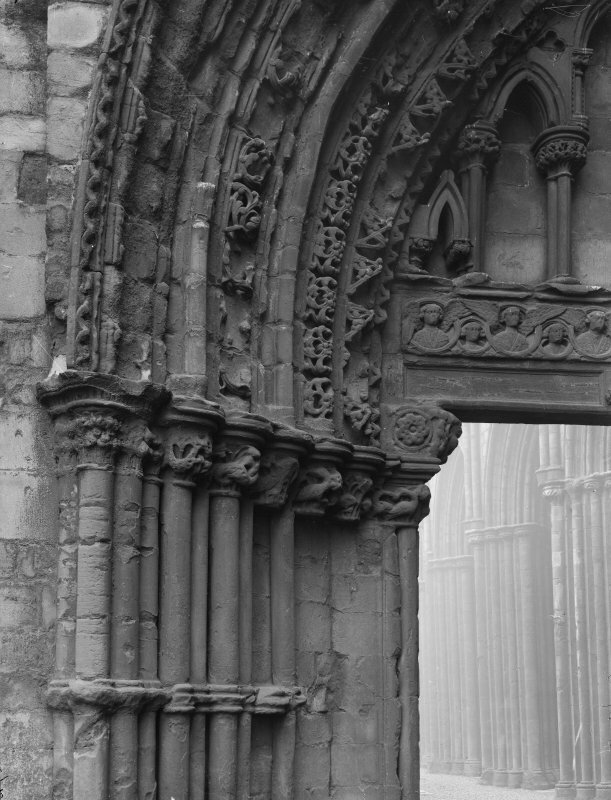 View of sculpture fragment in Holyrood Abbey. 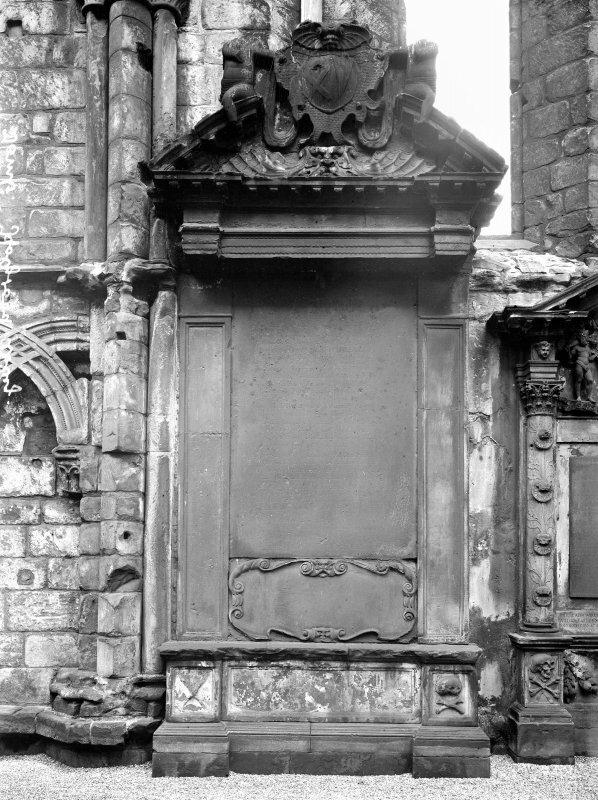 View of Milne memorial, on exterior of Holyrood Abbey. 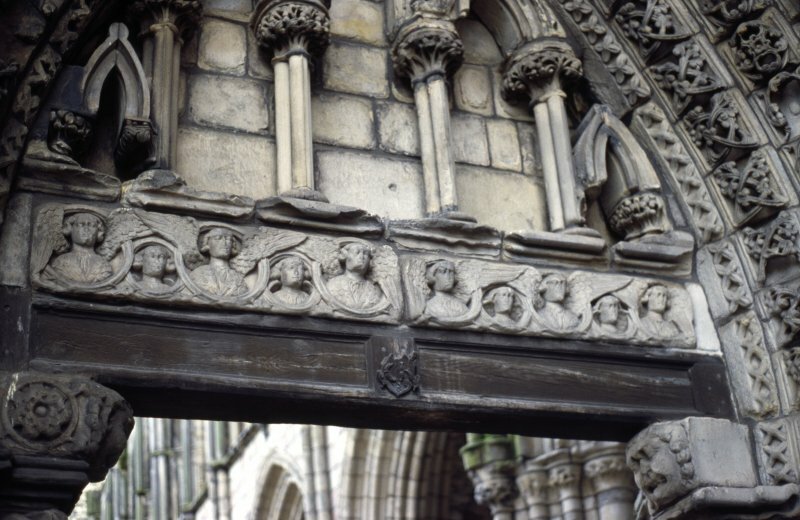 View of W facade of Holyrood Abbey, showing carved angel frieze on lintel of doorway, and a pair of masks supporting the lintel. 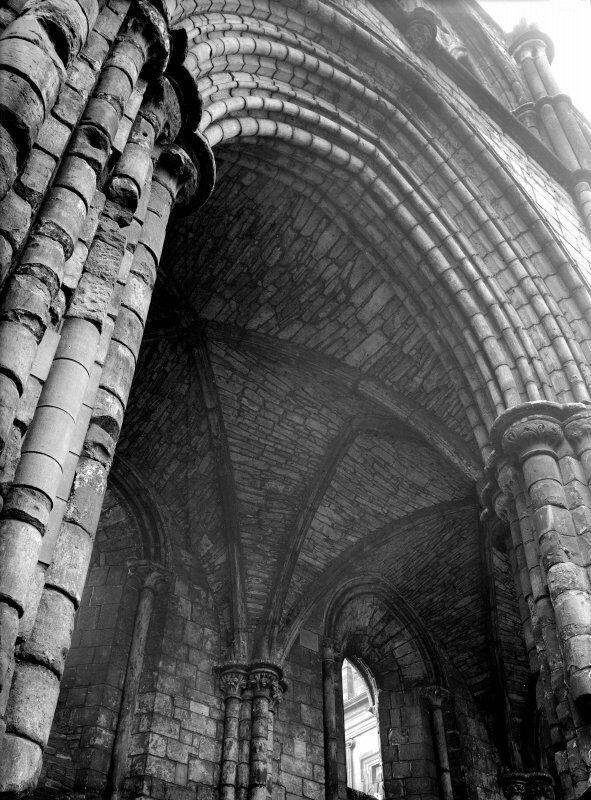 Holyrood Abbey. 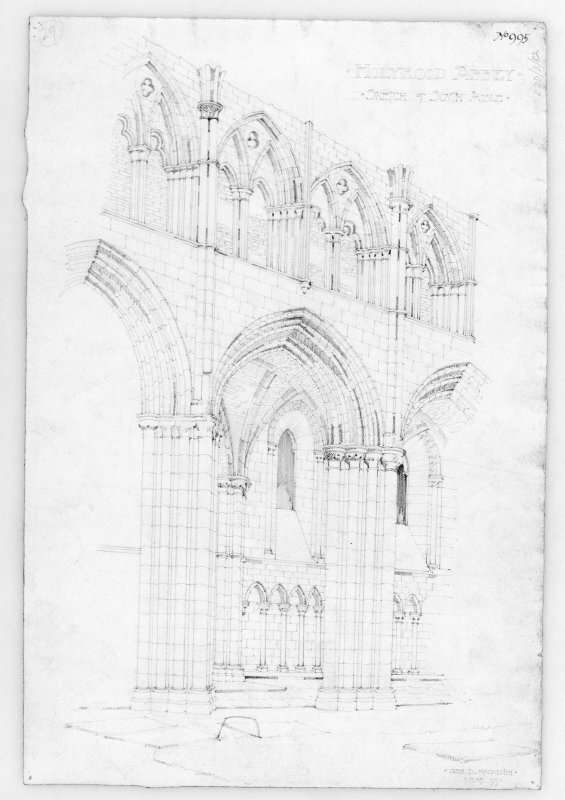 Sketch of south aisle. 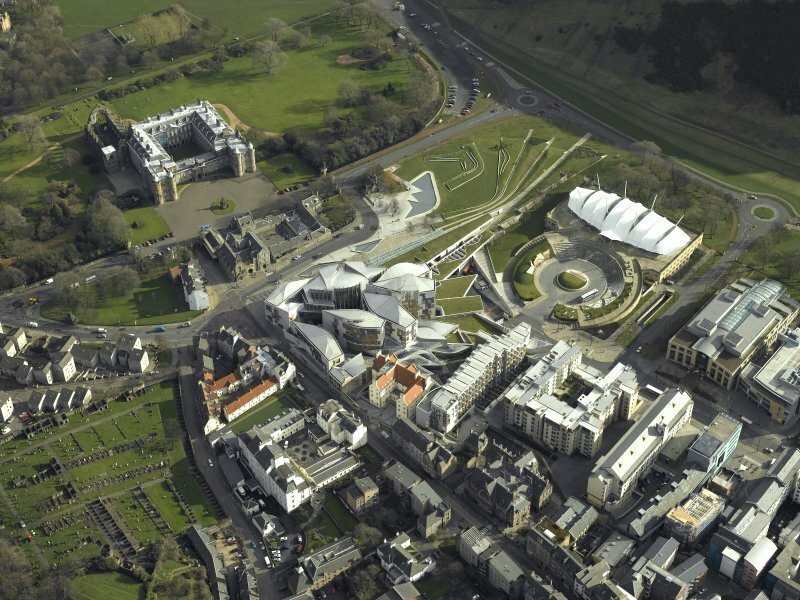 Oblique aerial view centred on Holyrood Palace, Abbey, new Parliament Building and 'Our Dynamic Earth' , taken from the ENE. 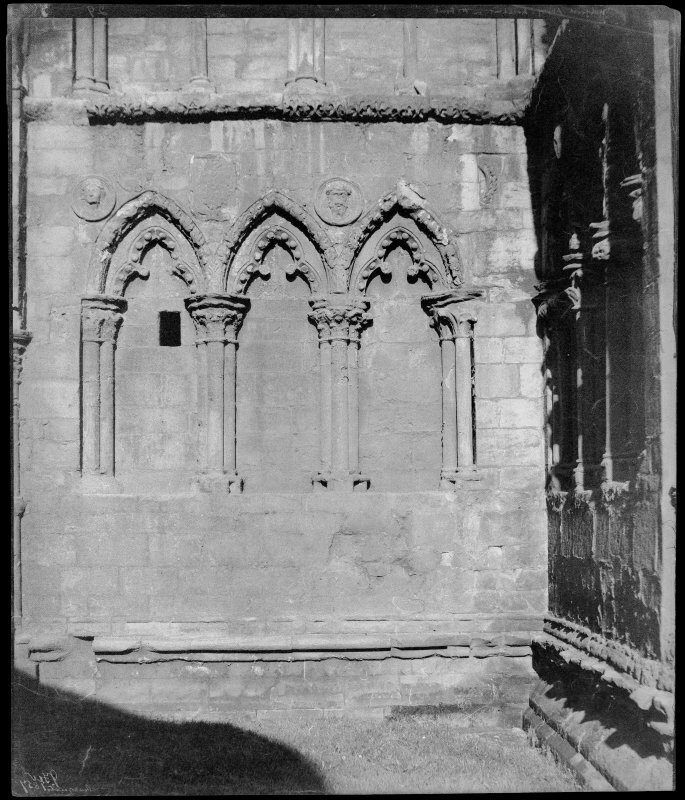 Scanned image of engraving showing Interior view of Holyrood Abbey Original inscribed: "Interior of Holyrood Chapel. Drawn & Engraved by Edw.d Blore. London, Published July 1, 1821, by Rodwell & Martin, New Bond Street. 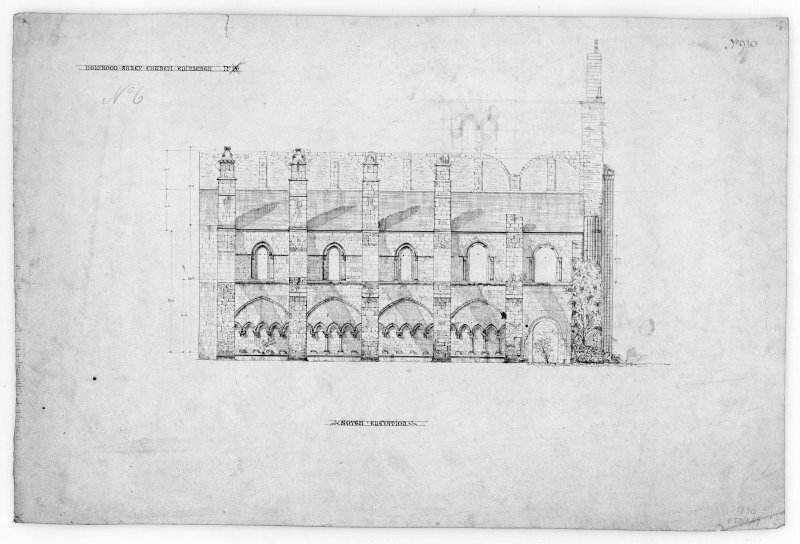 Printed by McQueen & Co."
Photographic copy of proposed Restoration of West Elevation of Holyrood Abbey and Conventual Buildings. u.s. u.d. 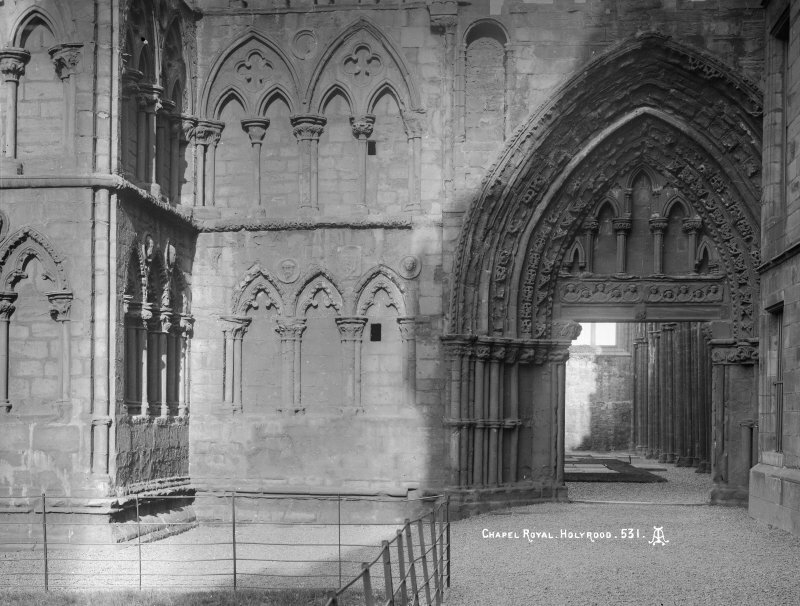 Photographic copy of perspective View of part of Nave and South Aisle of Holyrood Abbey From "The Building News. Nov. 30 1906." Insc. 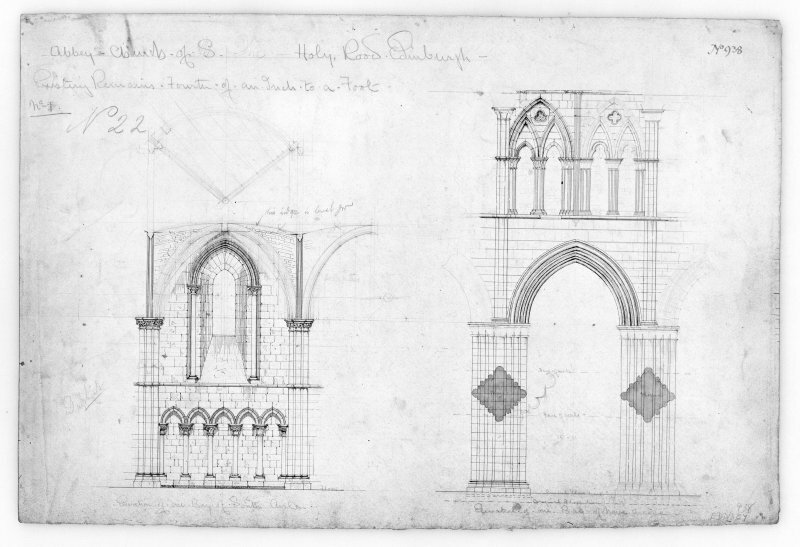 "From measured drawings by T.Forbes Maclennan. 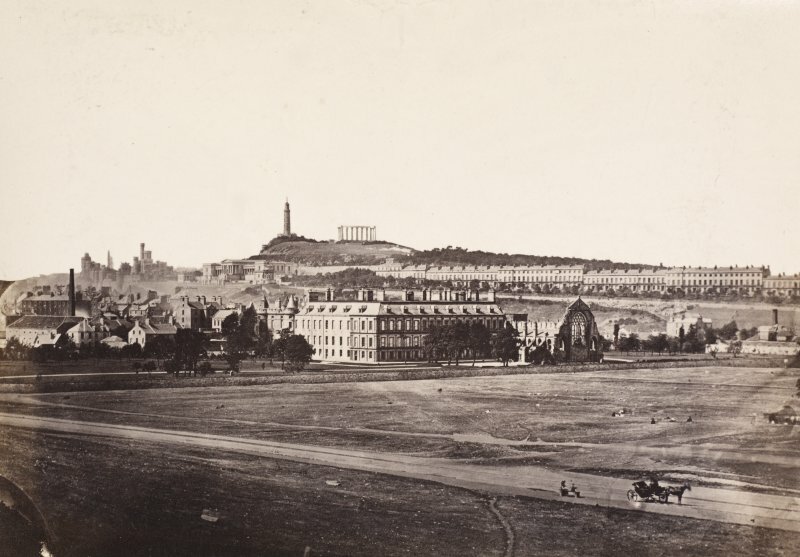 Photo-lithographed & Printed by James Akerman, 6 Queen Square, W.C."
Oblique aerial view of Edinburgh centred on both 'Dynamic earth' and the Scottish Parliament under construction, and a view of the Canongate, Holyrood Palace and Holyrood Abbey, taken from the NNE. 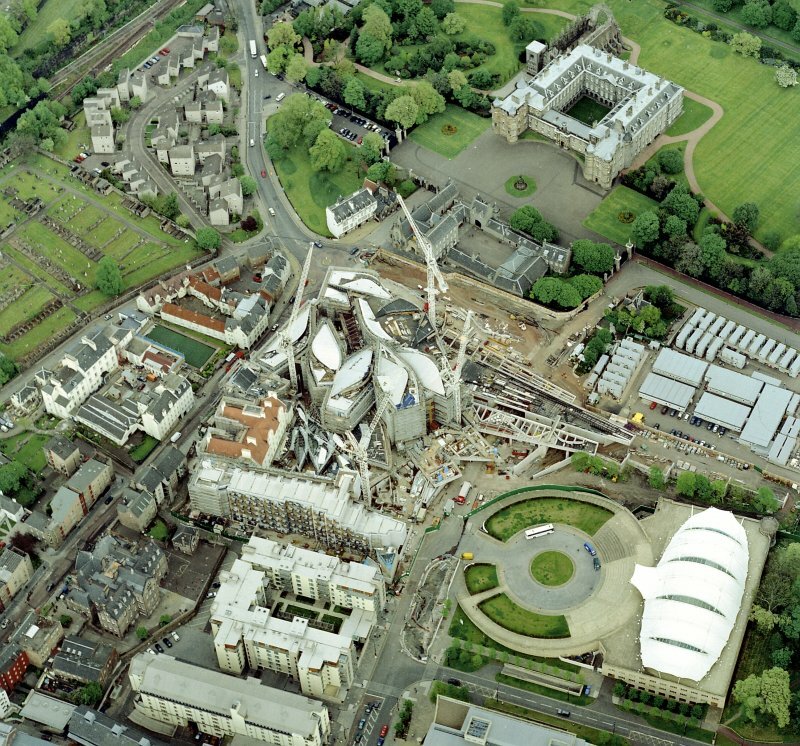 Oblique aerial view of Edinburgh centred on both 'Dynamic earth' and the Scottish Parliament under construction, and a view of the Canongate, Holyrood Palace and Holyrood Abbey, taken from the ENE. 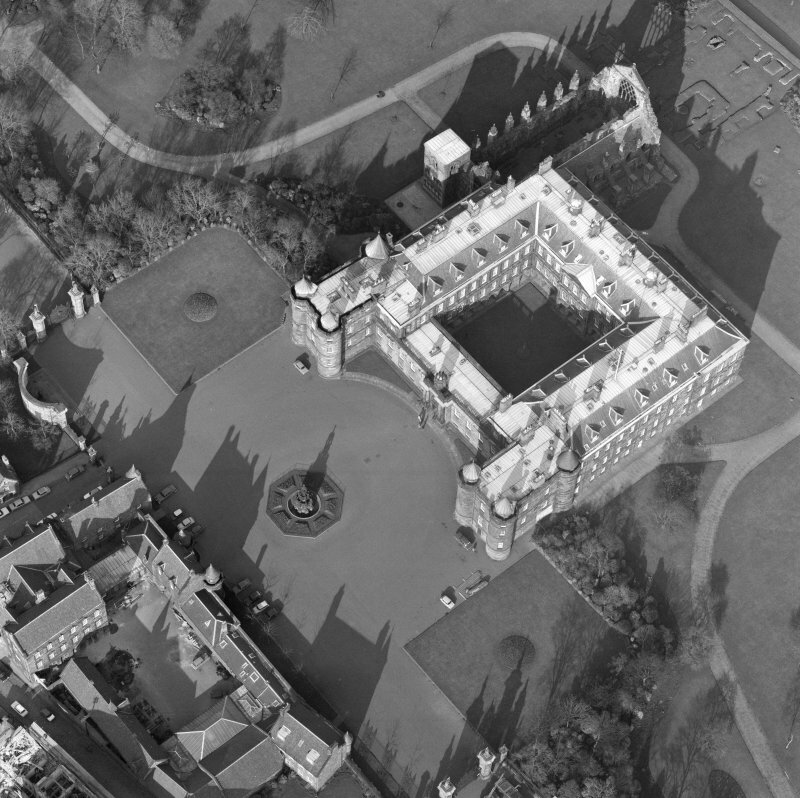 Oblique aerial view of Holyrood Palace and Abbey, Edinburgh, with fountain also visible. 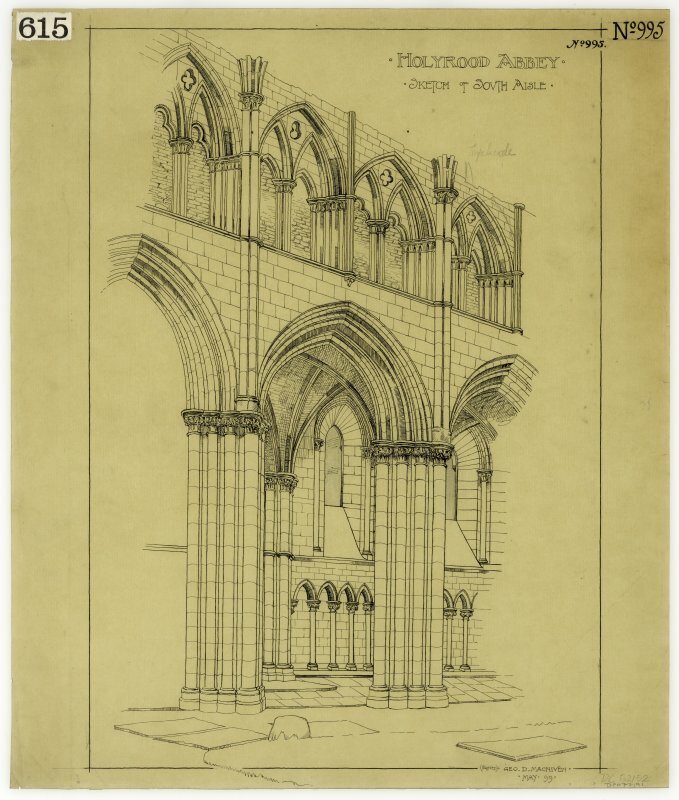 Sketch view of interior of Nave of Holyrood Abbey. Signed and Dated "Geo. D. Macniven. May 99." 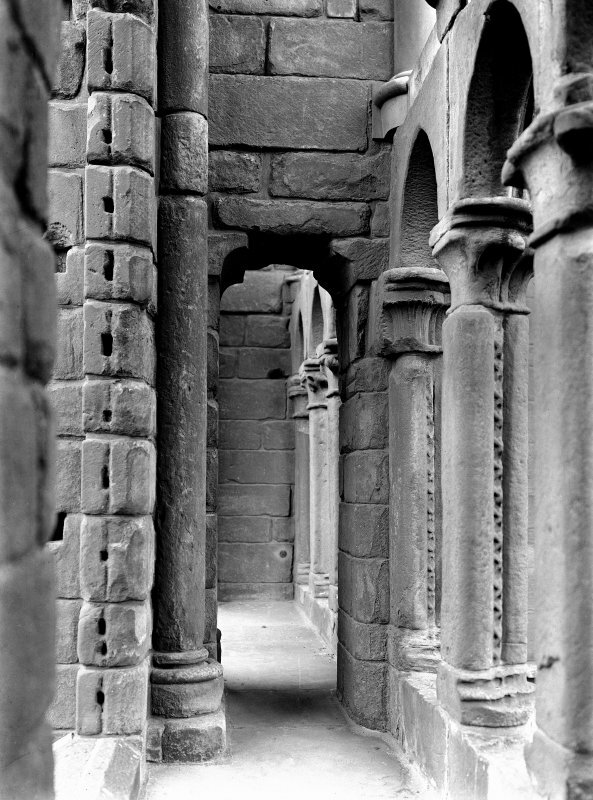 Details of Pier Arcade of Nave in Holyrood Abbey. u.s. u.d. 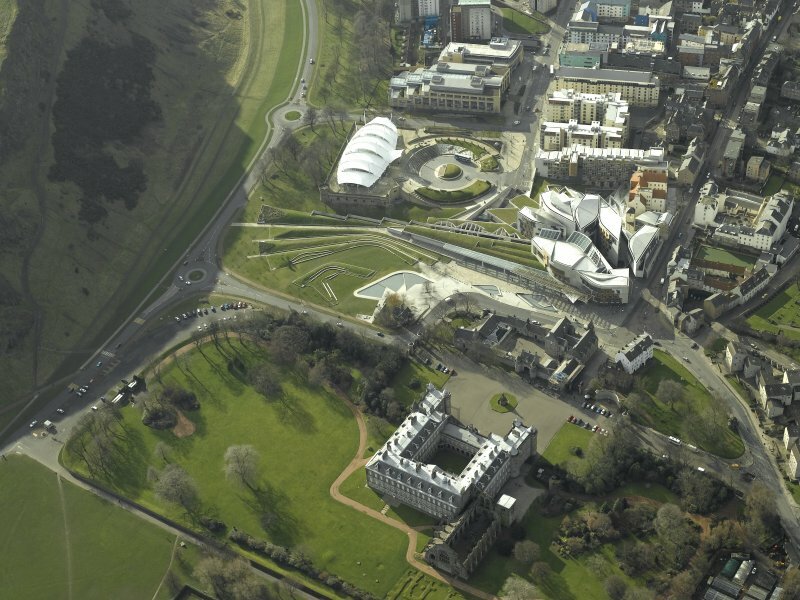 Oblique aerial view of Holyrood Palace and Holyrood Abbey, looking NW. 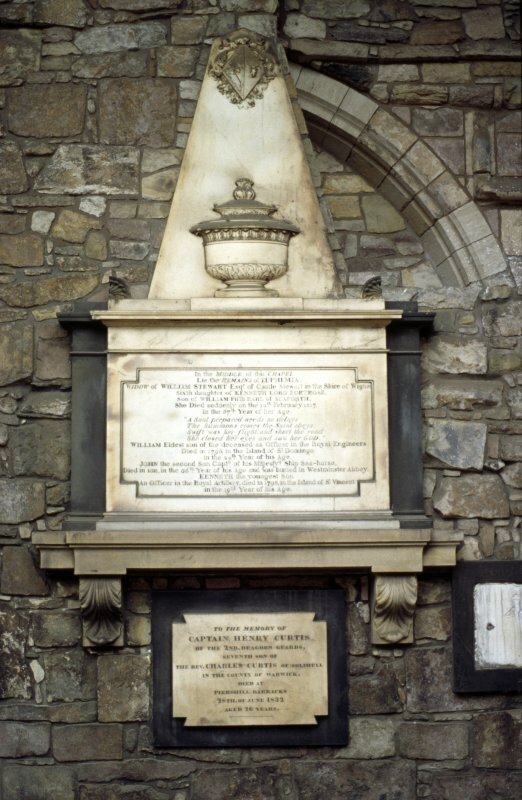 View of monument to Robert Douglas, Viscount Belhaven, inside W tower of Holyrood Abbey. 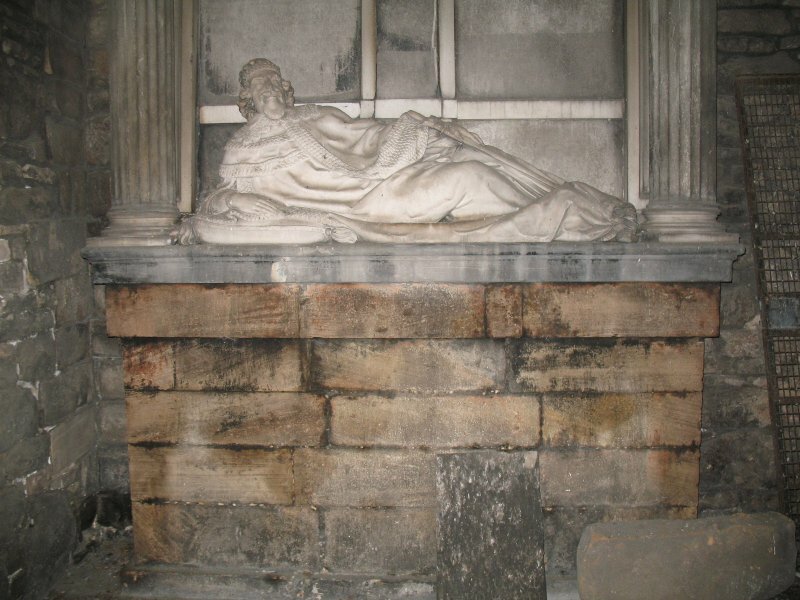 View of monument to Euphemia Stewart, on inside of S wall of Holyrood Abbey. 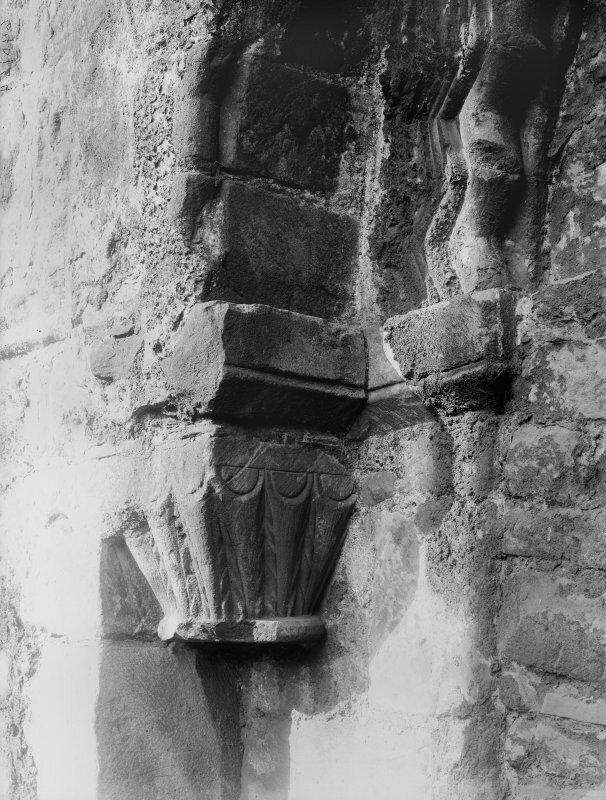 View of monument to Jane, Countess of Eglinton, against inside of N wall of Holyrood Abbey. 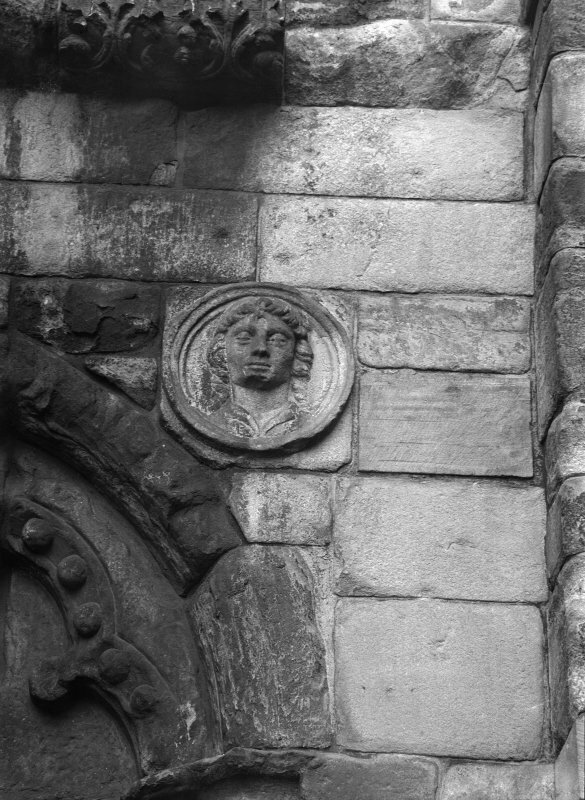 View of two carved medallion heads, between ground floor arches on S side of tower on W facade of Holyrood Abbey. 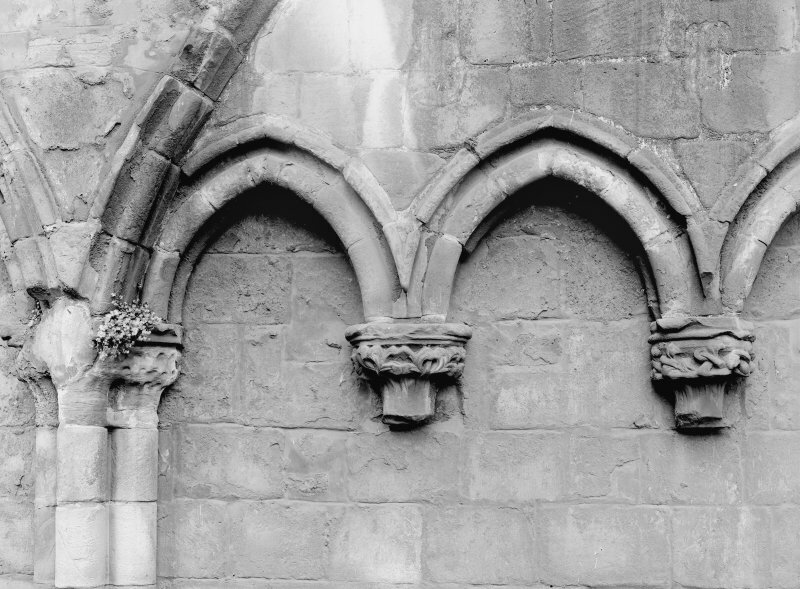 View of two carved medallion heads, between ground floor arches on W facade of Holyrood Abbey. 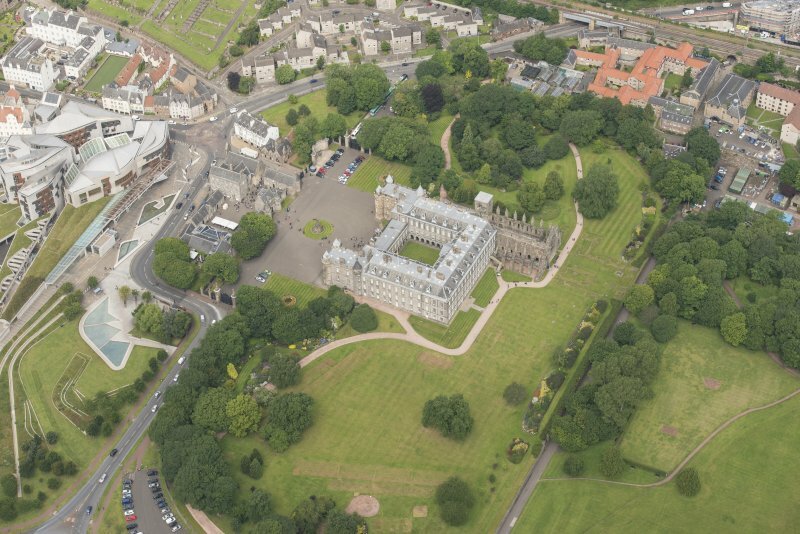 Aerial view of Holyrood Palace and Abbey. 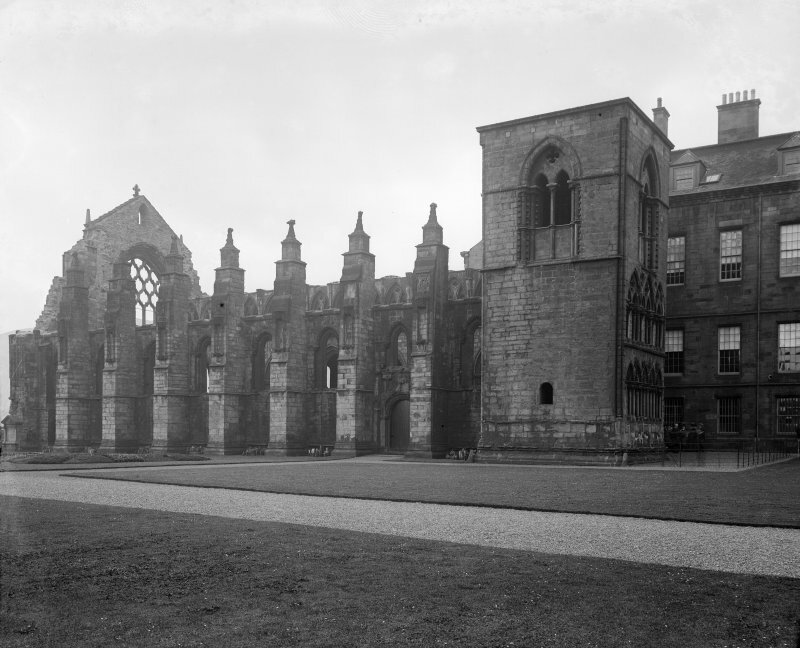 Holyrood Abbey. 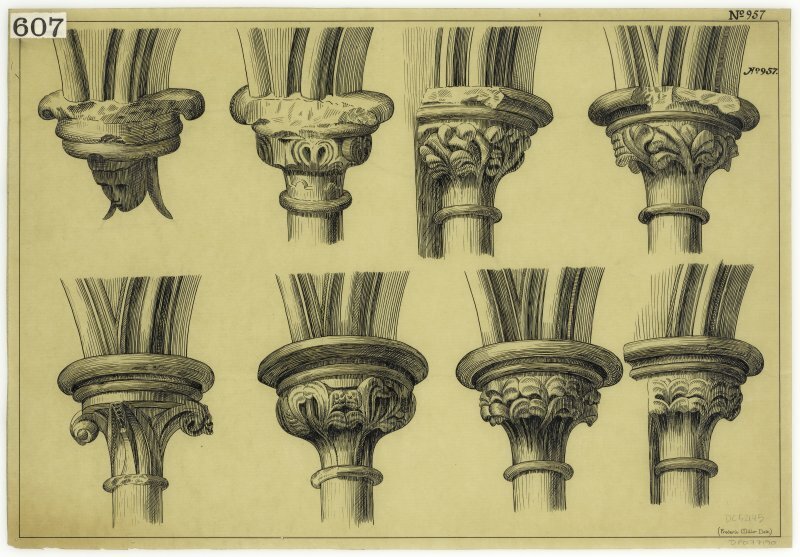 Details of capitals. 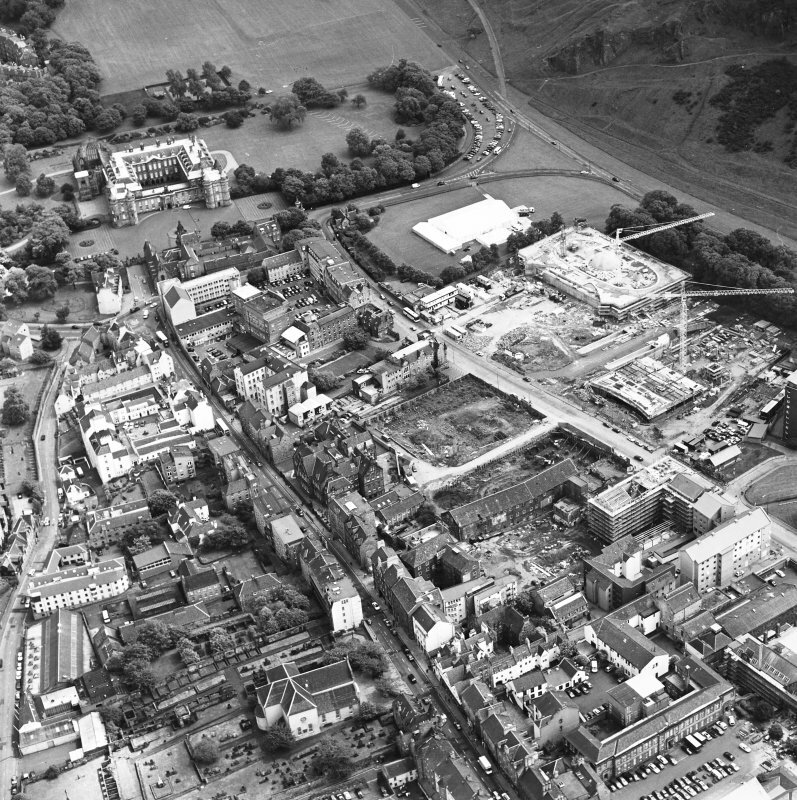 Oblique aerial view showing Holyrood Palace and Abbey, plus part of Abbeyhill. 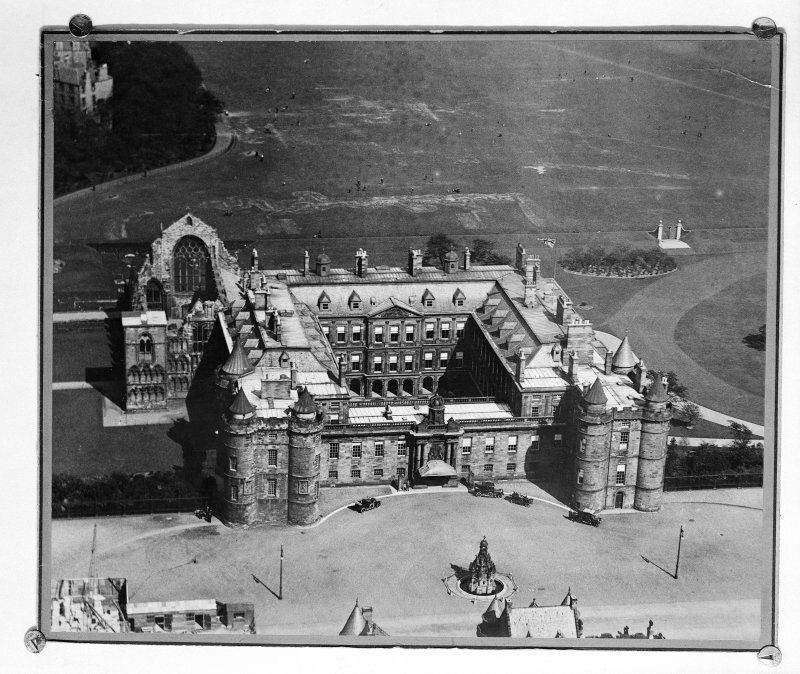 Photographic copy of plans and Elevations of Bay in South Aisle of Holyrood Abbey "Measured and drawn July '35 by James A. H. Mottram"
Oblique aerial view of Edinburgh centred on both 'Dynamic Earth' and the Scottish Parliament under construction, and a view of the Canongate, Holyrood Palace and Holyrood Abbey, taken from the SSW. 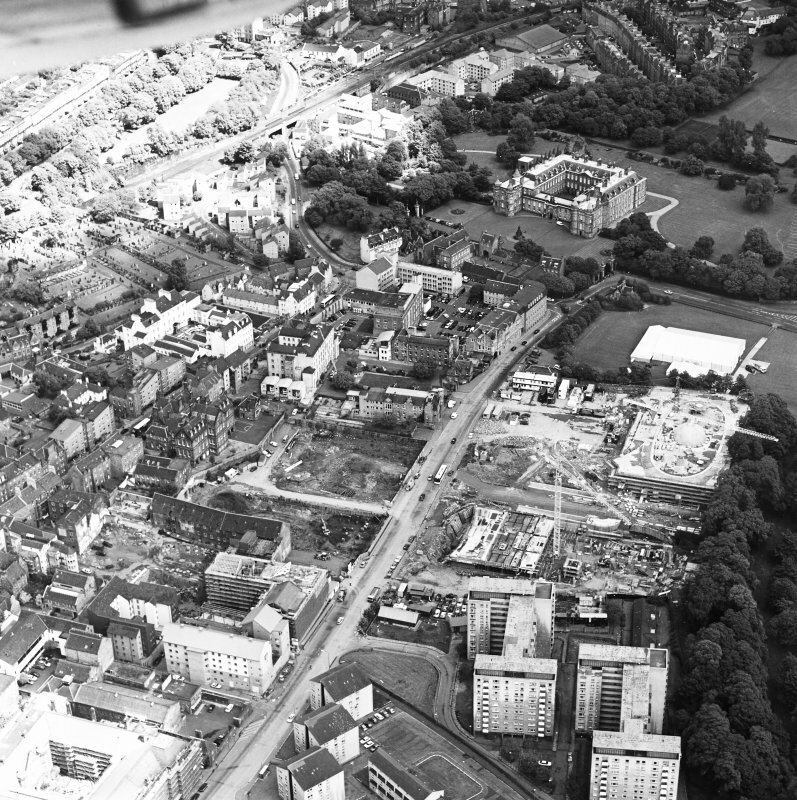 Oblique aerial view of Edinburgh centred on both 'Dynamic Earth' and the Scottish Parliament under construction, and a view of the Canongate, Holyrood Palace and Holyrood Abbey, taken from the WSW. 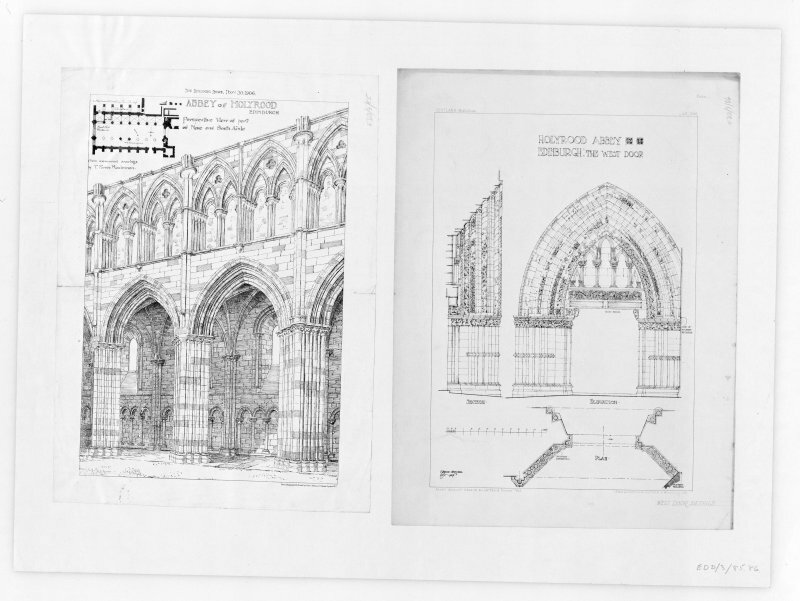 Details and Elevation of Triforium in Nave of Holyrood Abbey. u.s. u.d. 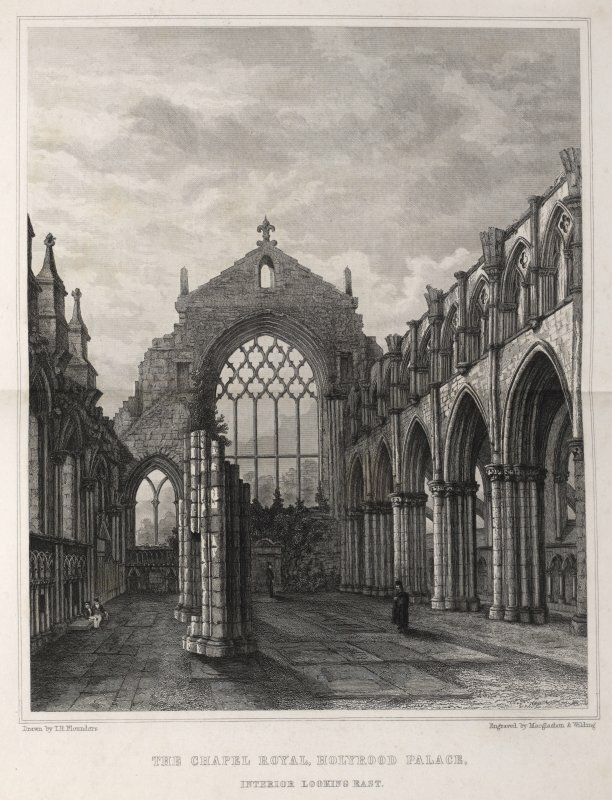 Photographic copy of engraving showing interior view of Holyrood Abbey. 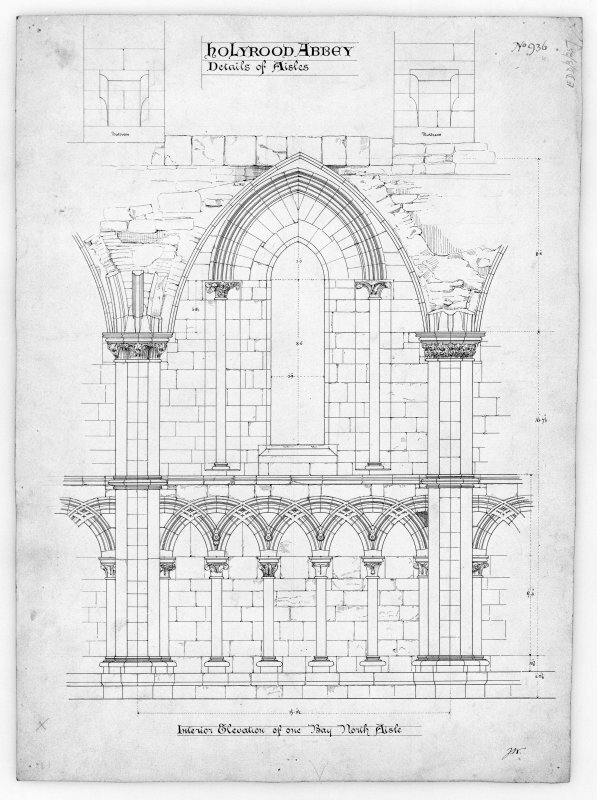 Copied from Vitruvius Scoticus, Plate 5. Engraved by P Mazell; drawn by Wyck. 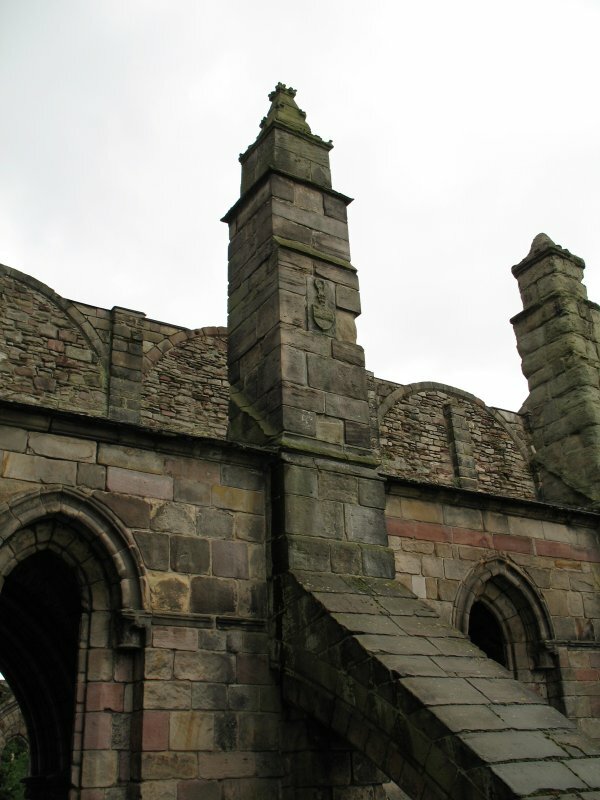 View of architectural details on exterior of Holyrood Abbey. 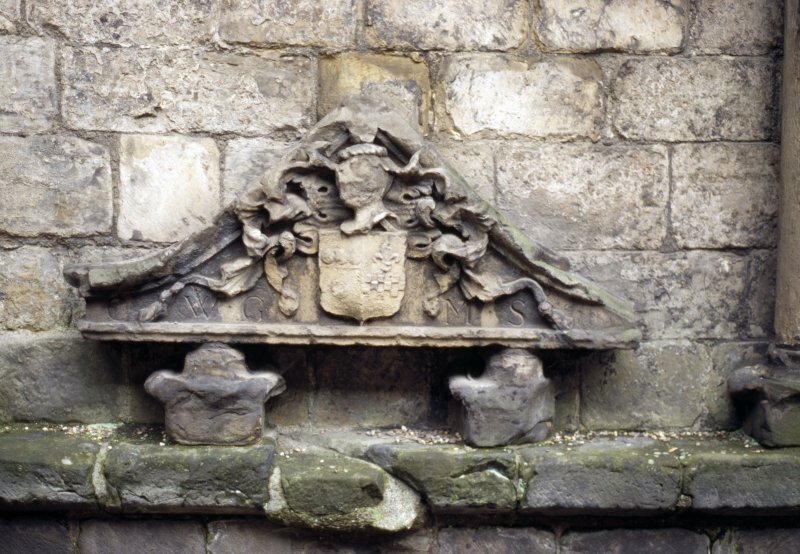 View of coat of arms of Graham and Stewart, aginst inside of N wall of Holyrood Abbey..
View of panel with angel's head and grotesque mask, above W door of Holyrood Abbey.. 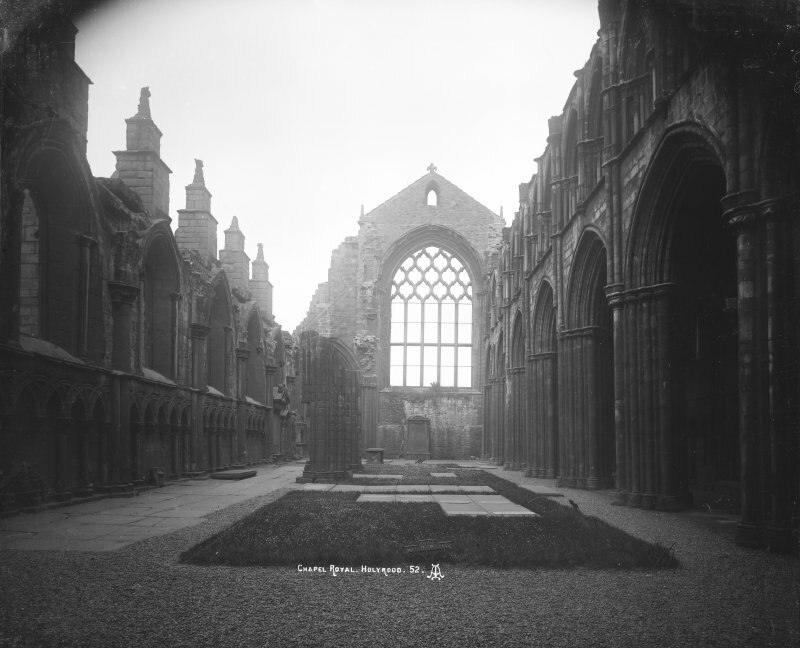 Photographic copy of engraving showing interior view of Holyrood Abbey Insc. 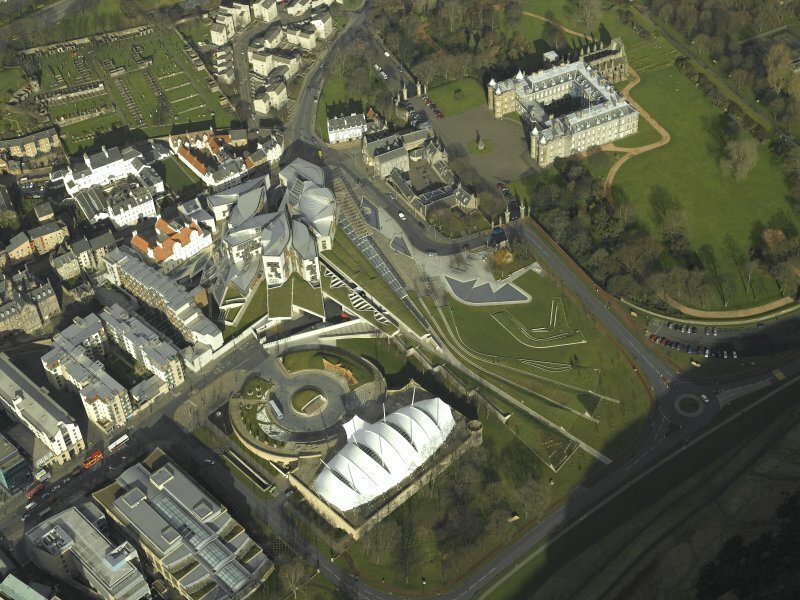 "Chapel Royal at Holyrood. 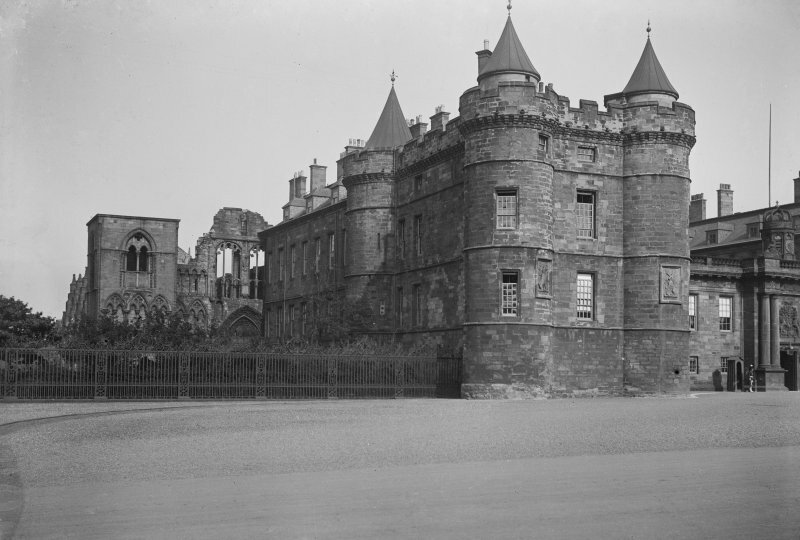 Restored as it was in the reign of James VII. 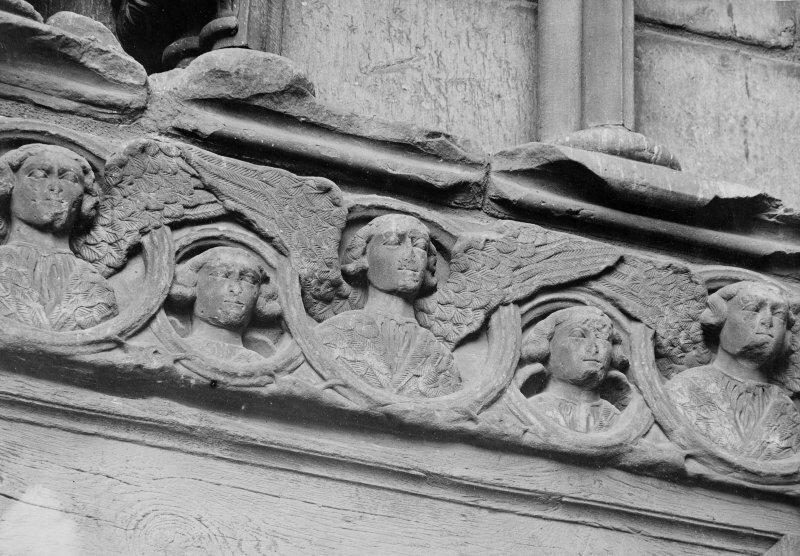 Restored by N.Tennant, Archt. 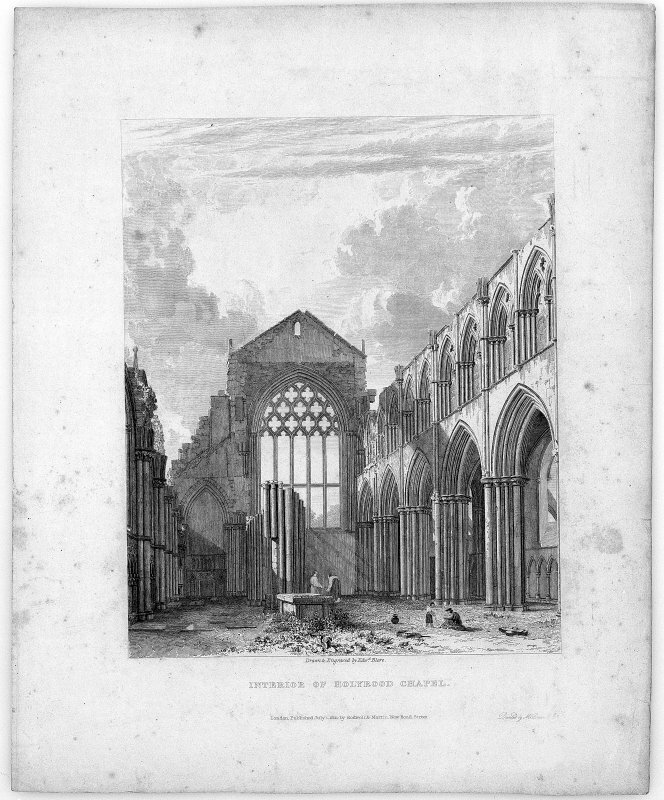 Engraved by J.West. Drawn & Engraved for D.Anderson 1849." 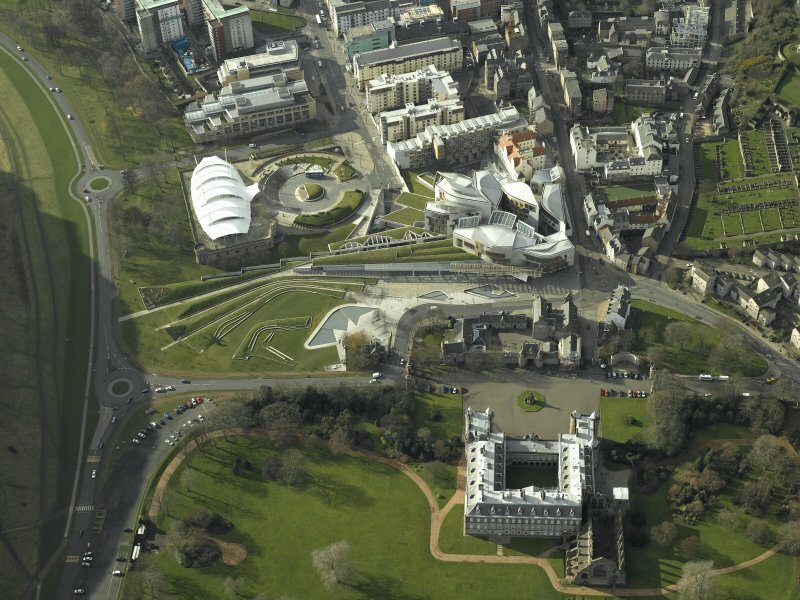 Oblique aerial view centred on Holyrood Palace, Abbey, new Parliament building and 'Our Dynamic Earth', taken from the SW.
Oblique aerial view centred on Holyrood Palace, Abbey, new Parliament building and 'Our Dynamic Earth', taken from the NE. 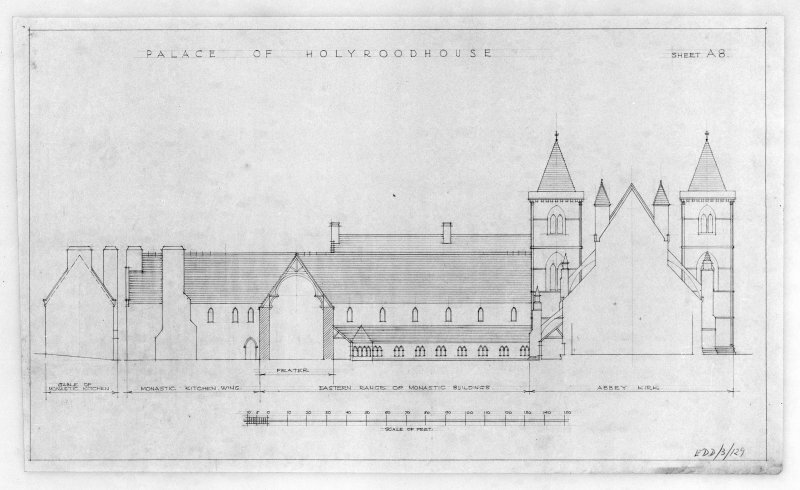 Photographic copy of proposed Restoration of North Elevation of Holyrood Abbey and Conventual Buildings u.s. u.d. 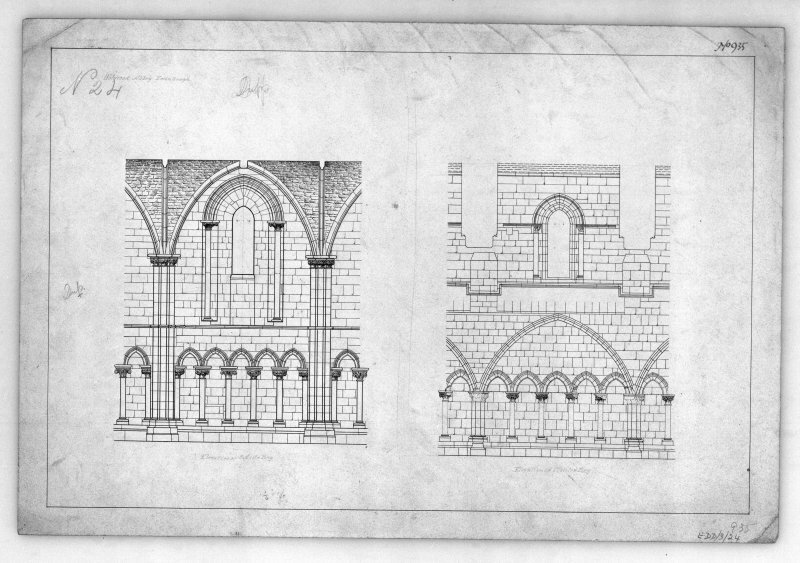 Elevations of Bay on South side of Nave of Holyrood Abbey. u.s. u.d. 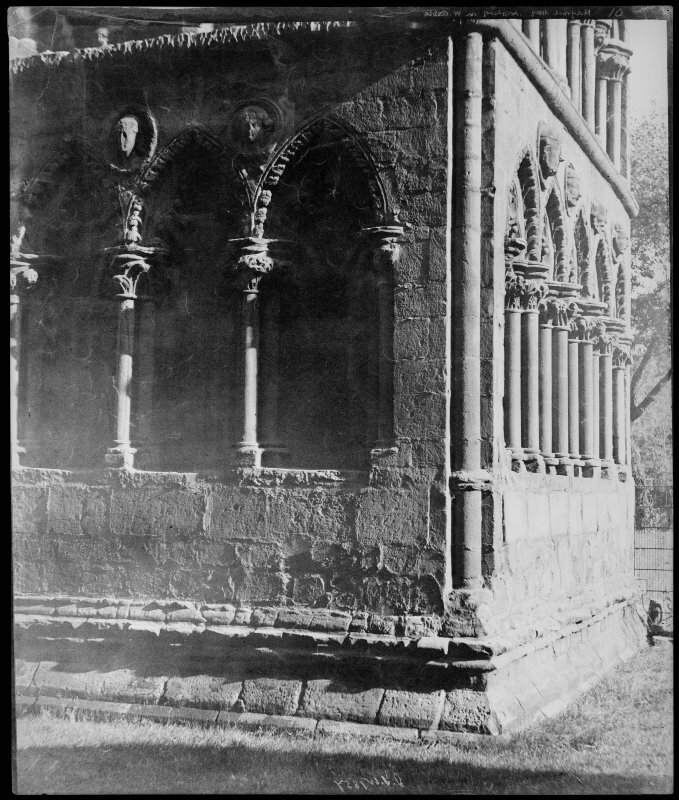 (Centred NT 2696 7398) Ruins of Abbey Church AD 1128 (NR) Nave (NR) Choir (NR). 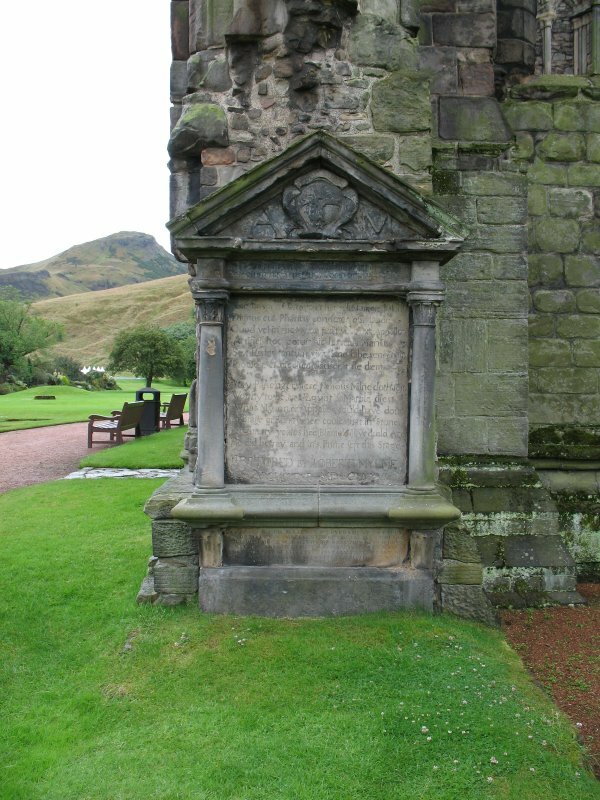 The Abbey of Holyrood was founded in 1128 by David I for Augustinian Canons. 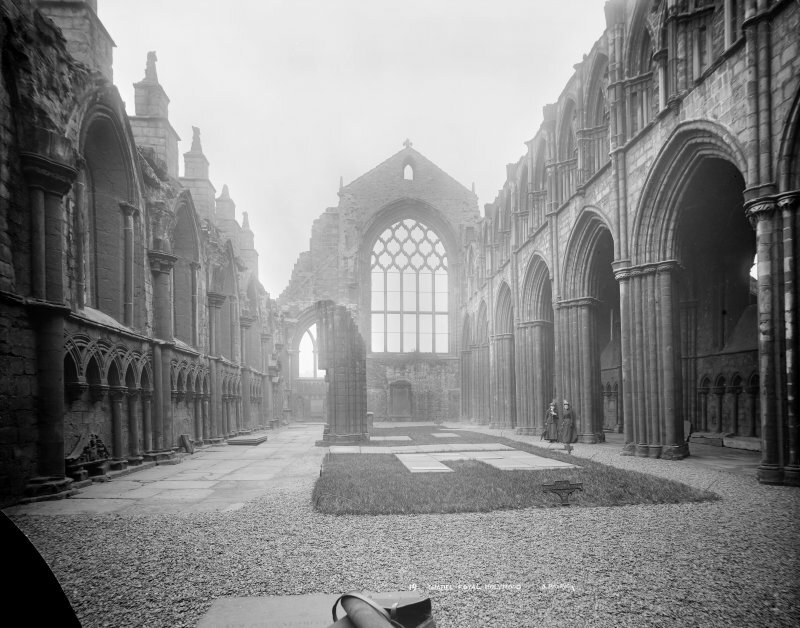 All that survives above ground is the ruined nave as repaired and consolidated by HMoW in 1911. Foundations of vanished choir and transepts were found in course of this work and left open for inspection. 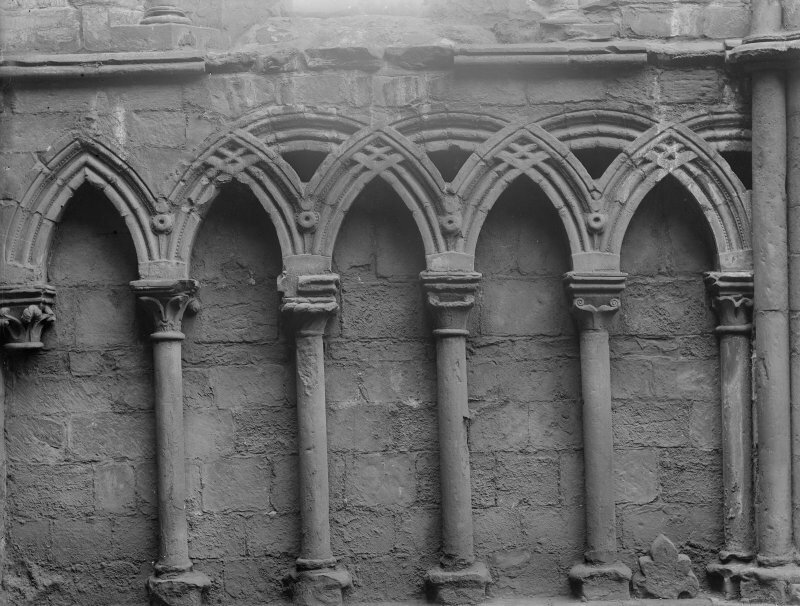 Within the area of the choir and nave remains of the original 12th century abbey church were found. In the latter part of the 12th century it was decided to rebuild the church on a more sumptious scale which was developed during the next two centuries. 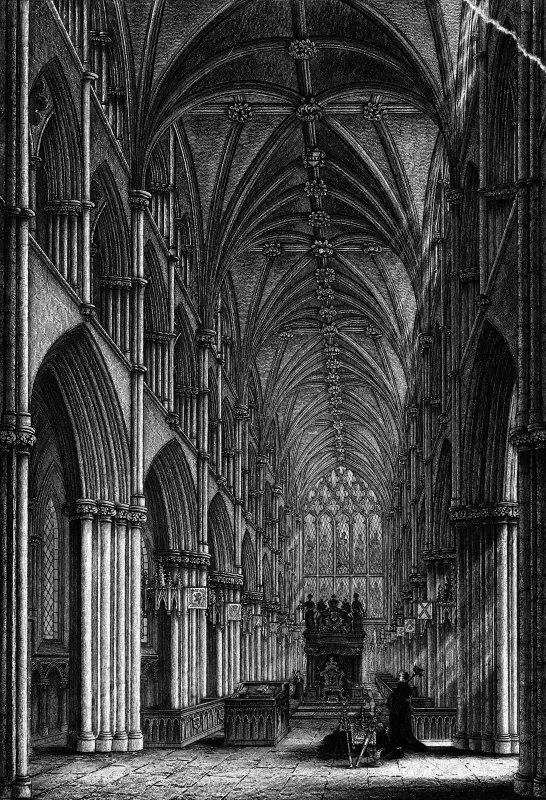 It comprised a nave of 8 bays with western towers; N and S transepts each of two bays with an E chapel-aisle; and an aisled choir of 6 bays including a lady chapel. 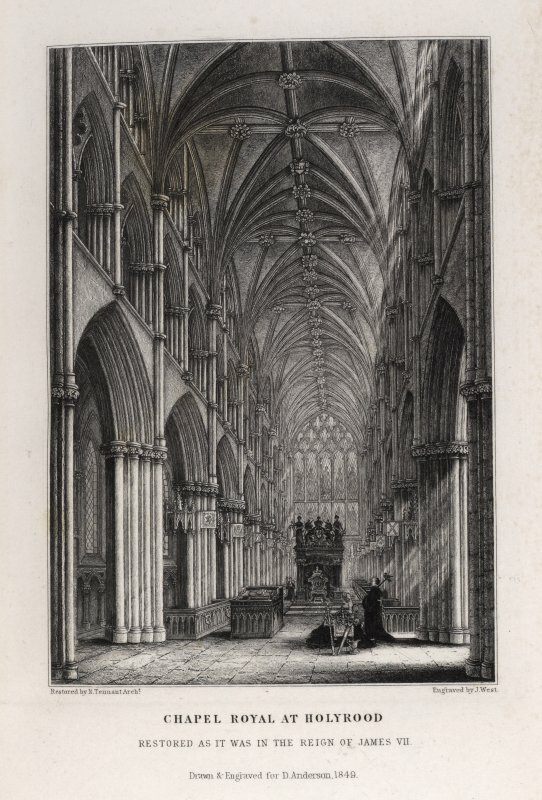 In 1544 and 1547 the abbey was burnt and looted by Hertford's troops and in 1570 the choir and transepts were pulled down and the remaining portion of the nave was repaired and the church reduced to its present dimensions. NT 269 740 During the upgrading of the Victorian boilerhouse, human remains were uncovered. 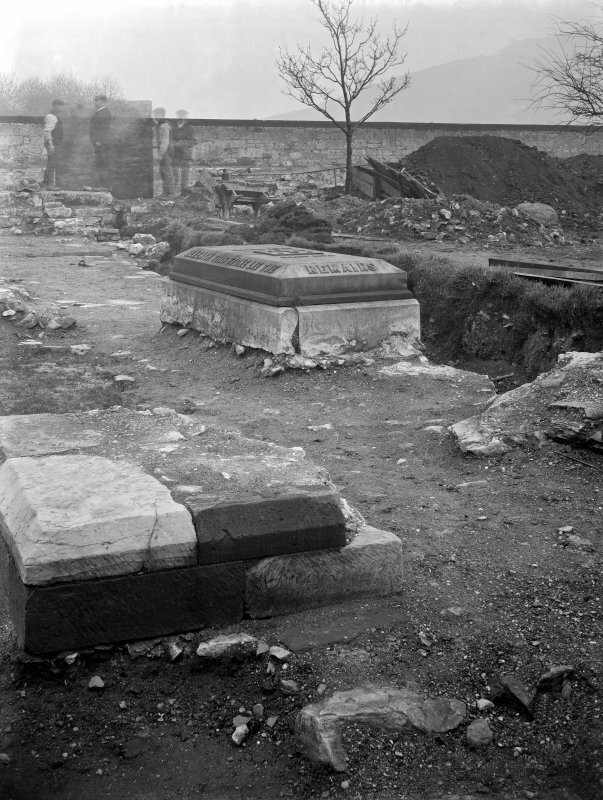 Excavation by GUARD revealed the remains of a minimum of 38 individuals from two main phases of burial which form part of the medieval and post-medieval cemetery at the abbey church. The initial phase of burial was badly disturbed by a large pit. 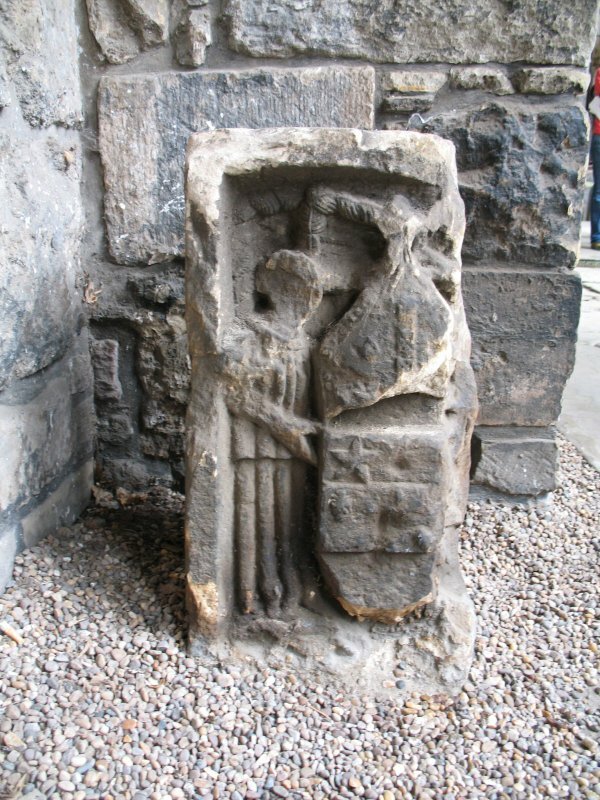 After this filled up, a layer of building rubble and debris covered the site; this included fragments of mortar, stained glass, lead came and architectural fragments. Through this a second phase of burials were dug. 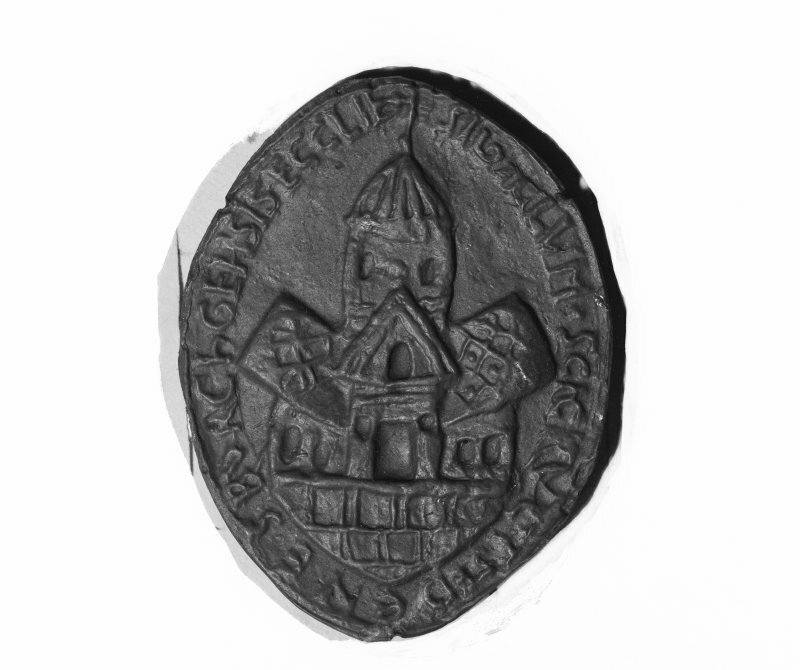 Two coins from the reign of Edward I/II deposited c.1330 were recovered including one from a burial. A copper jetton or counter was also recovered; this was minted in France in the 14th-15th centuries. NT 2696 7398 An area in the NW corner of the nave was excavated in May and June 2001 to ascertain the nature of the upper deposits and the cause of drainage problems. 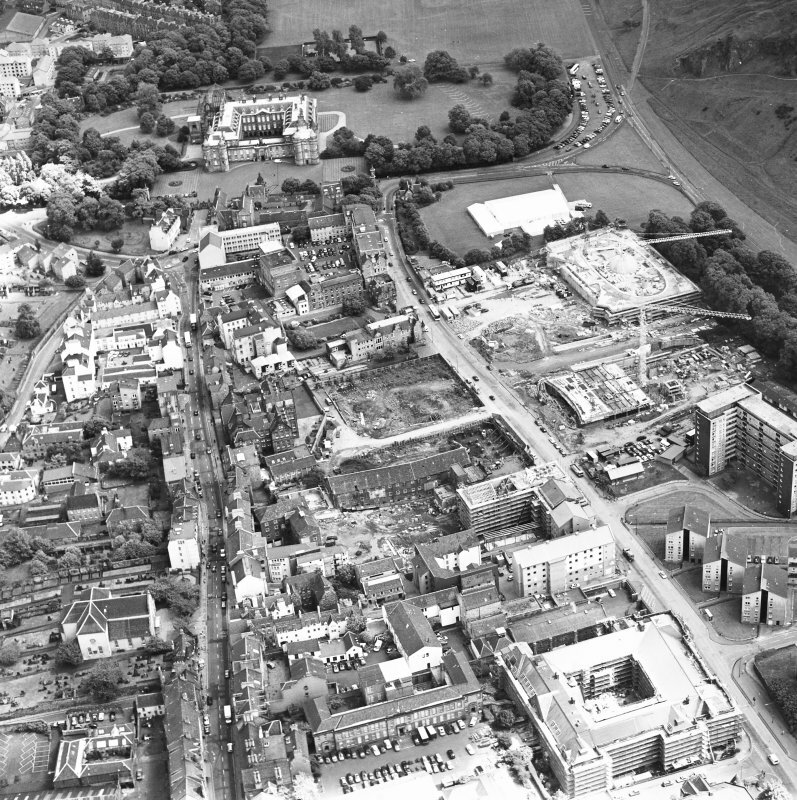 Features excavated and recorded included gravels, drainage, graves, a medieval deposit and wall foundations. Recommendations were made to alleviate the drainage problems. 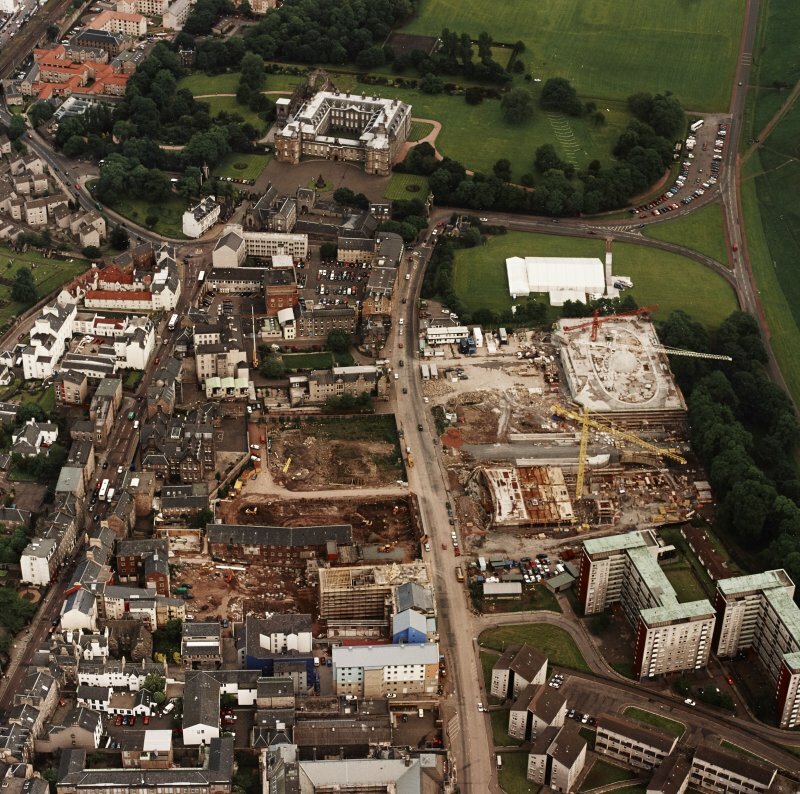 c NT 269 739 A watching brief was undertaken in April 2005 during the excavation of extensive trenches in the gardens around the Palace of Holyroodhouse (NT27SE 35.00) and the abbey (NT27SE 35.01). 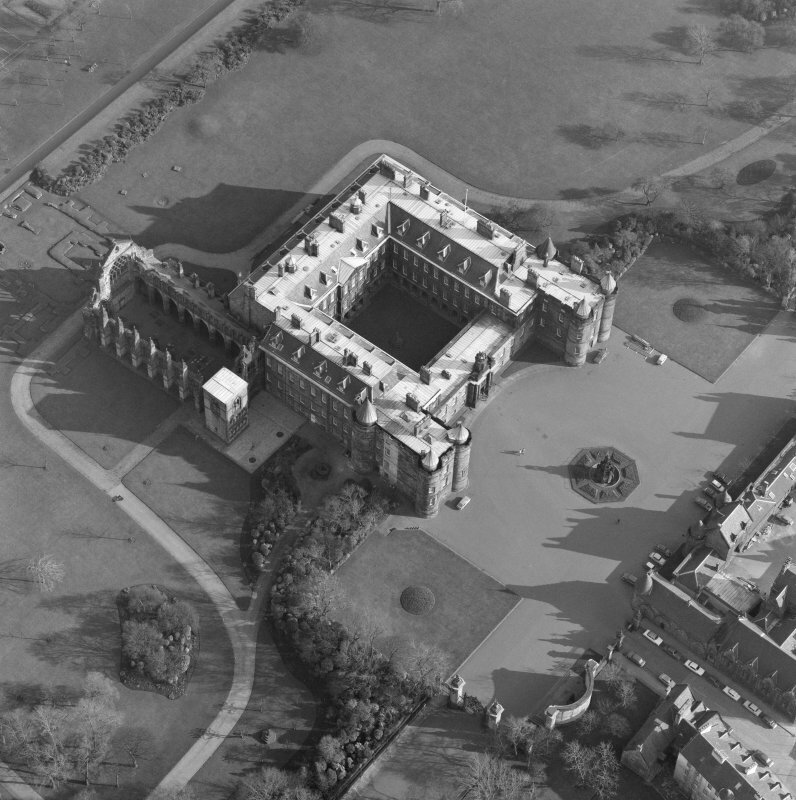 The archaeological potential of these areas was somewhat limited by the extensive landscaping works undertaken in the gardens over the last two centuries, although there was a higher chance of encountering buried features near the ruinous abbey. There were no finds or features of archaeological significance. 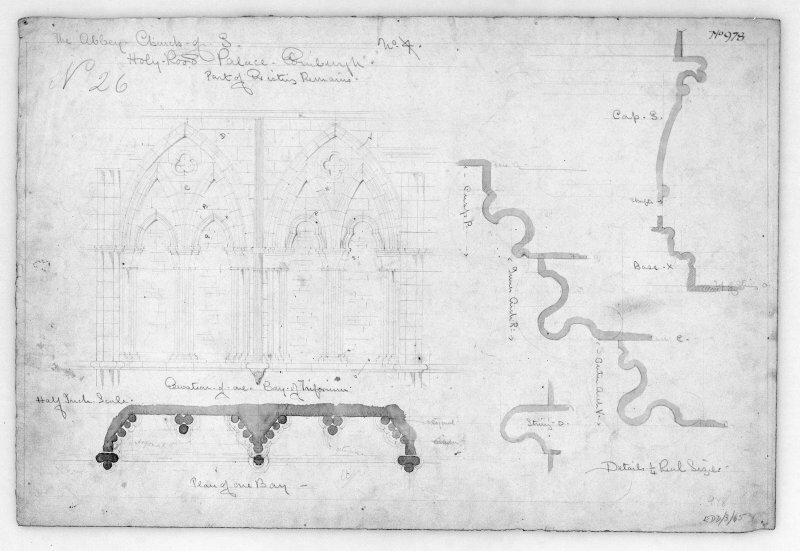 NMRS Photographic Survey of drawings for Holyrood Abbey in the collection of Ancient Monuments branch, SDD and transferred to the Scottish Record Office including: survey drawings by James Gillespie Graham 1832; designs for restoration and additions by James Gillespie Graham and A W N Pugin 1837 and a set of working drawings for the restoration by James Gillespie Graham 1837. 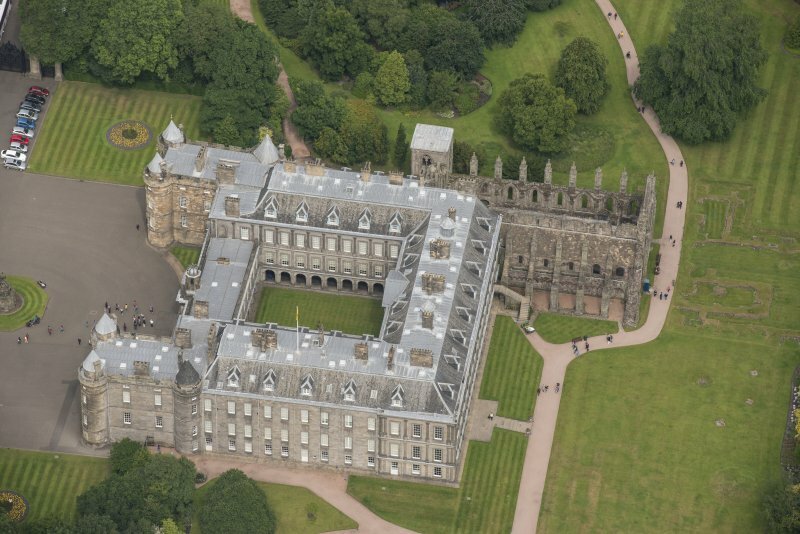 Peal of bells for the Church of Holyroodhouse. 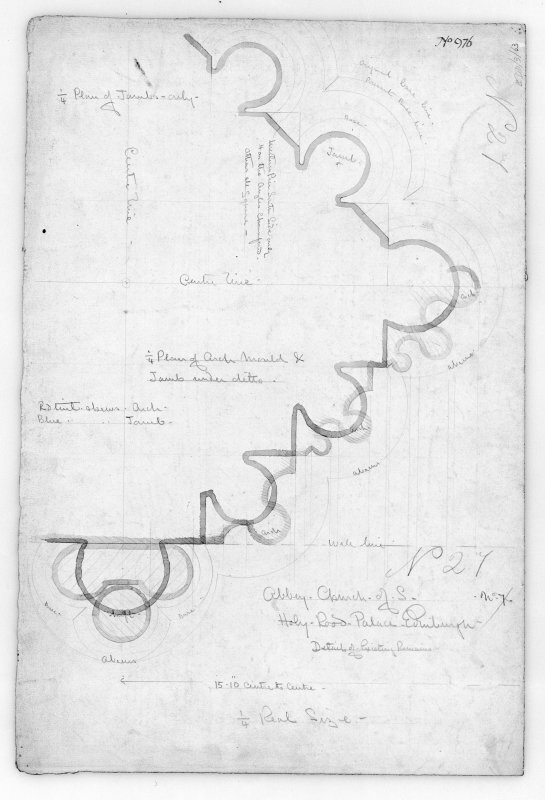 Royal letter to the Earl of Mar, Treasurer, about the use of two broken cannock to make a peal of bells. 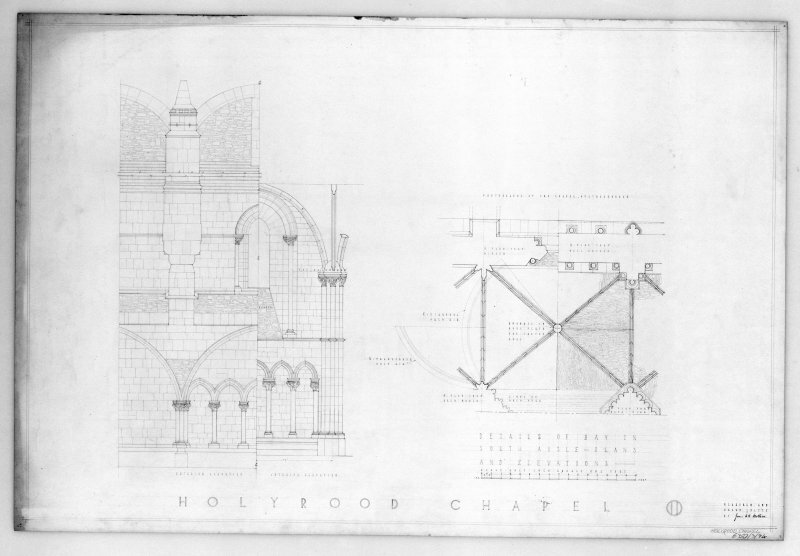 Restoration of the Chapel of Holyrood Palace. 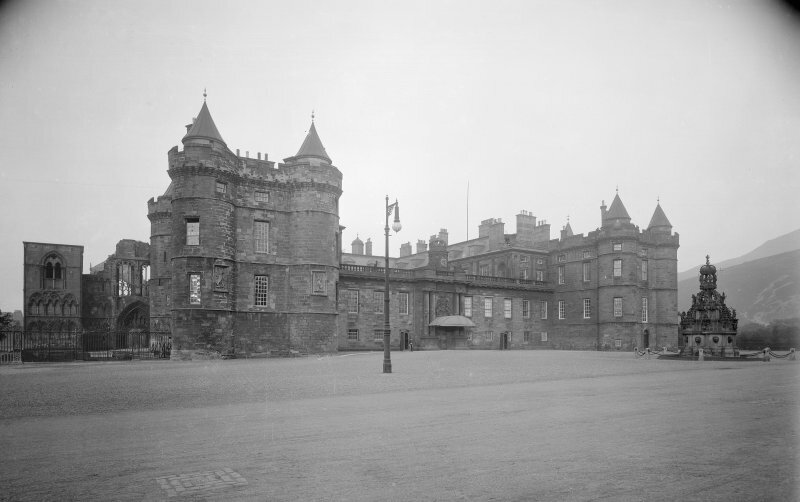 Letter to the Marquis of Breadalbane from James Gillespie Graham, architect. He asks that the matter of Restoration be drawn to the Queen's attention. 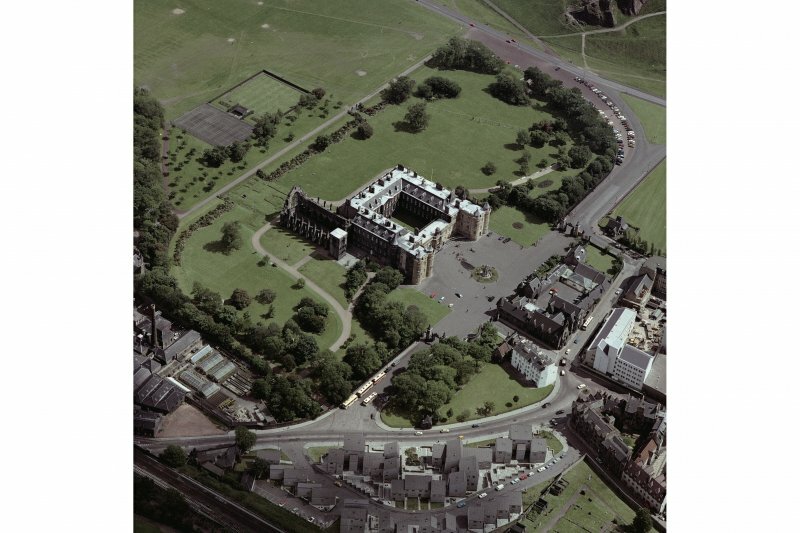 Oblique aerial photographs of Holyrood Palace and Abbey, Edinburgh, by Mr John Dewar in 1971. 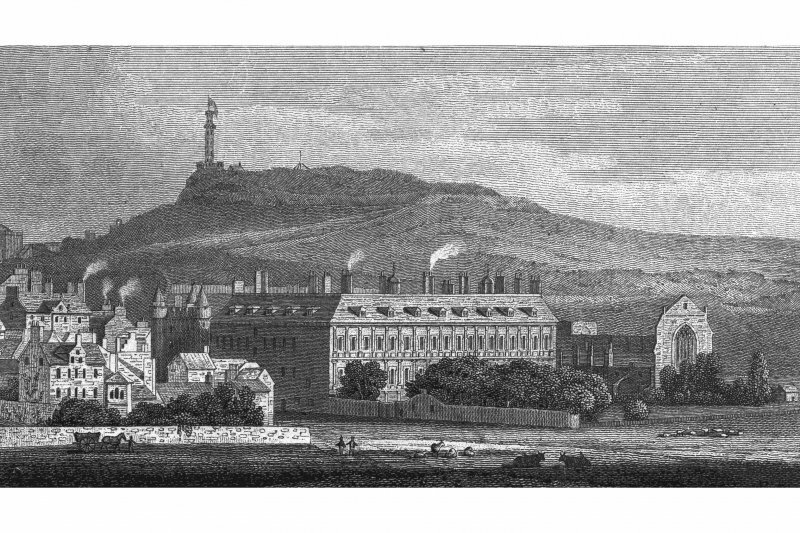 The site chosen for the Abbey was at the lower east end of the rocky ridge that tails down from the castle. It was fairly level ground, but boggy, infertile and unhealthy until foirly recent times. 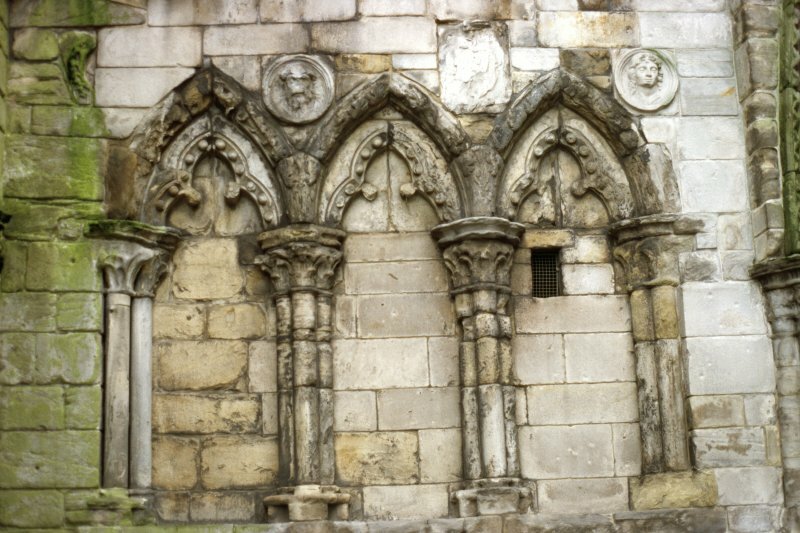 The original structure that was laid out in 1128 was apparently cruciform in shape and unaisled except for a chapel aisle on the eastern side of each transept. 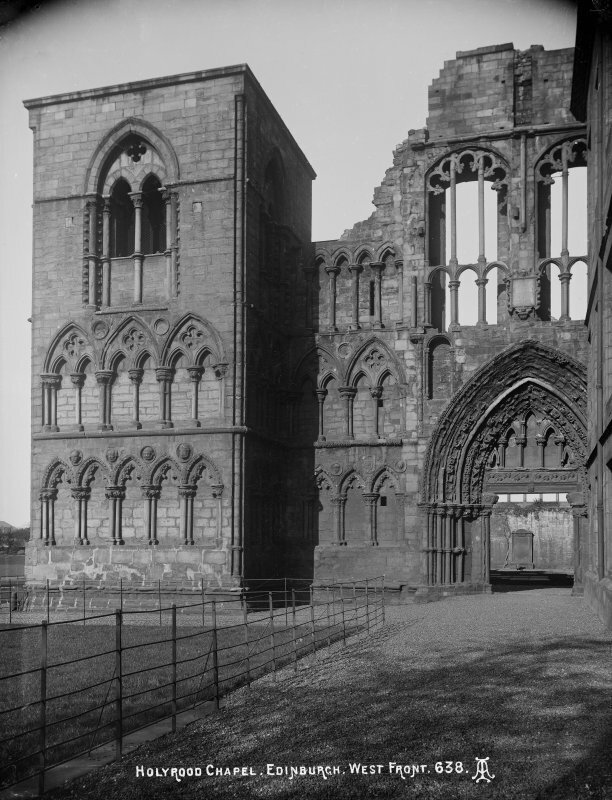 In the second half of the twelfth century, it was decided to rebuild the abbey church on a much grander scale. That project took two centuries to complete. 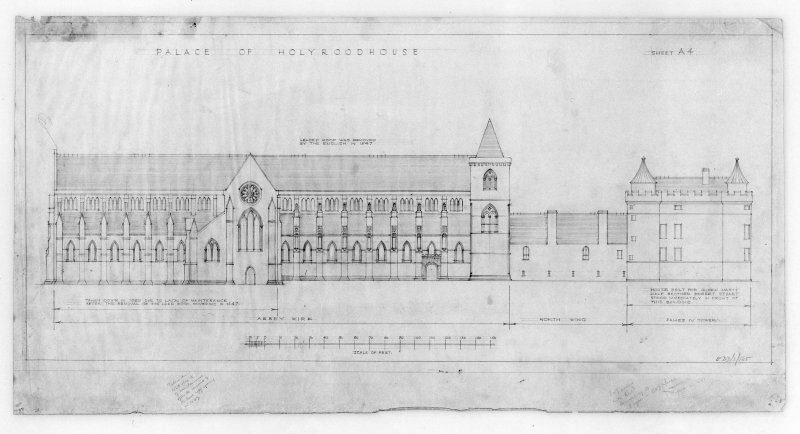 The new building comprised a nave of eight bays with western towers, north and south transepts, each of two bays with an eastern aisle. 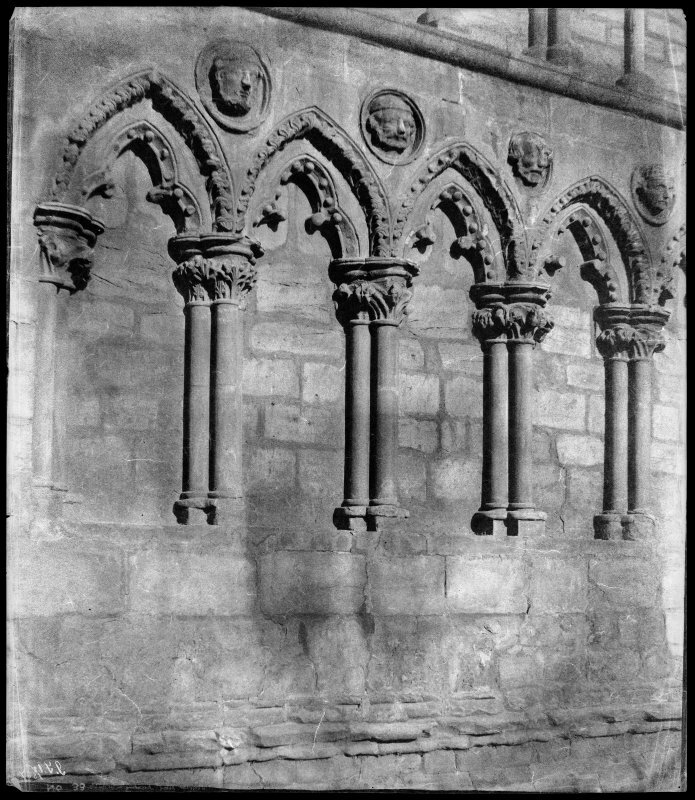 In addition, there was a large choir of six bays including a Lady Chapel two bays wide (RCAM, 1951, 130). 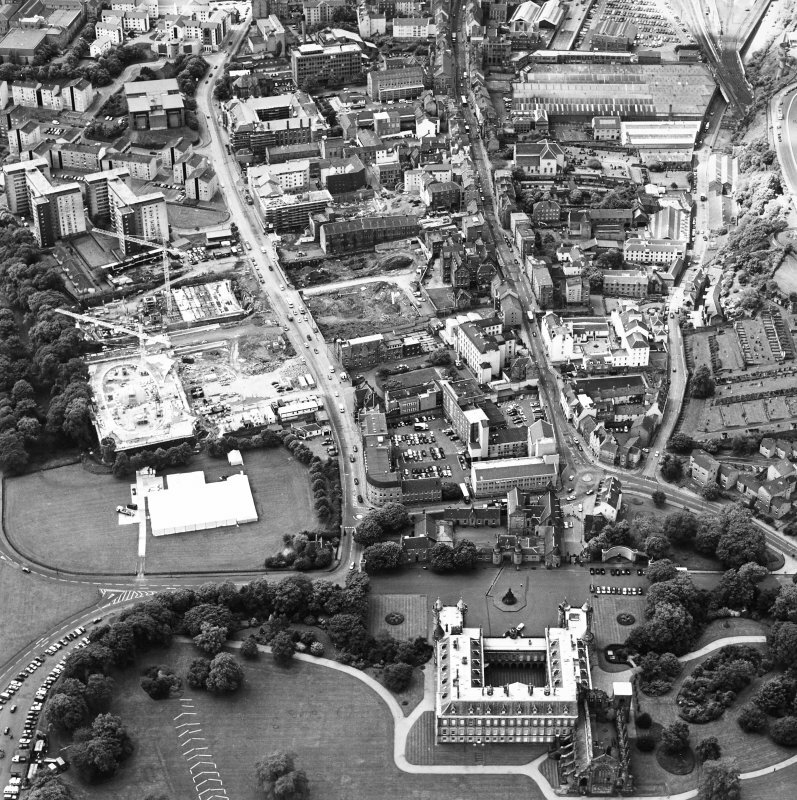 The site also included the necessary domestic quarters, infirmary, offices, guest house, and abbot's house (Richardson, 1950, 4). 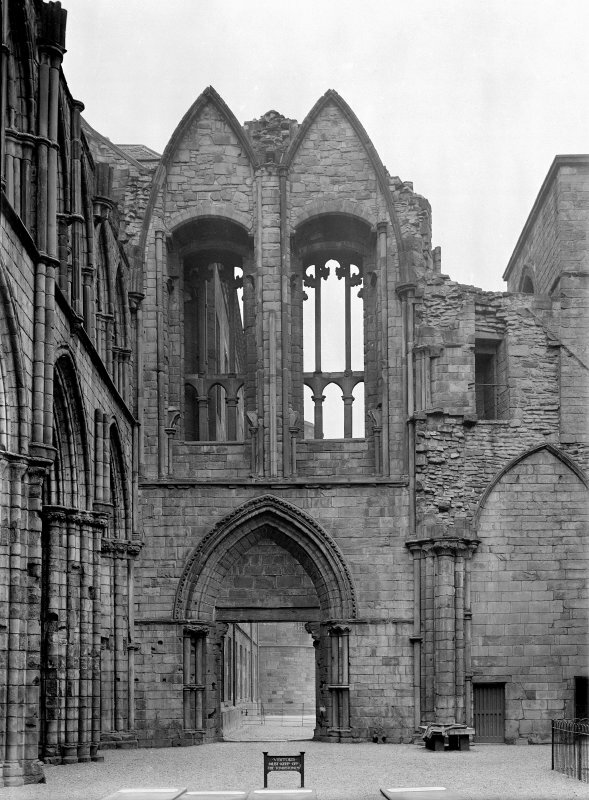 In 1544 the Abbey was burned and looted by the English, and it suffered further damage during an attack in 1547. 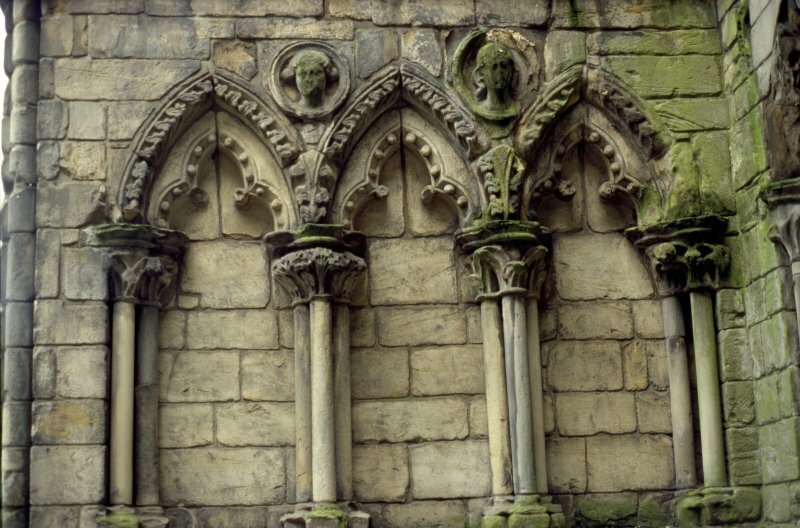 After 1570 the commendator of the Abbey allowed the ruinous choir and transepts to be pulled down and money arising from the sale of the material to be used to repair and refurbish the nave which contained the parish church. 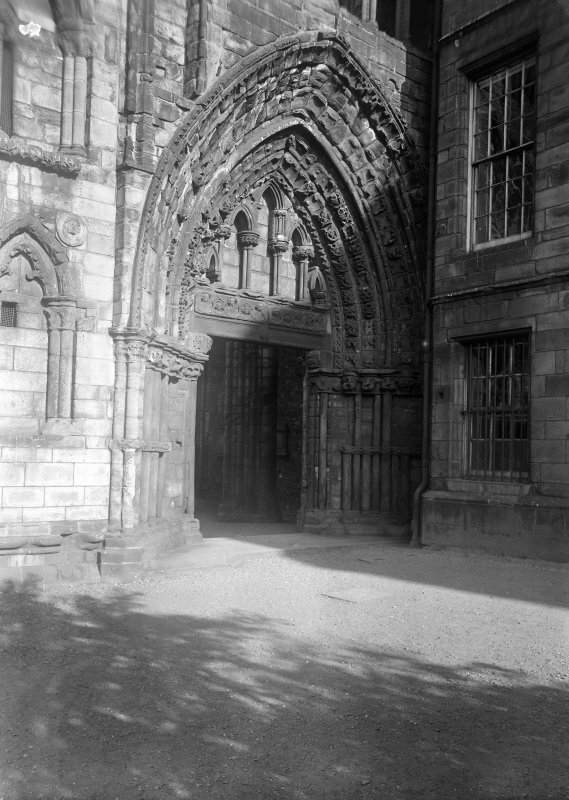 With that, the church was immediately reduced to its present proportions (RCAM, 1951, 131). 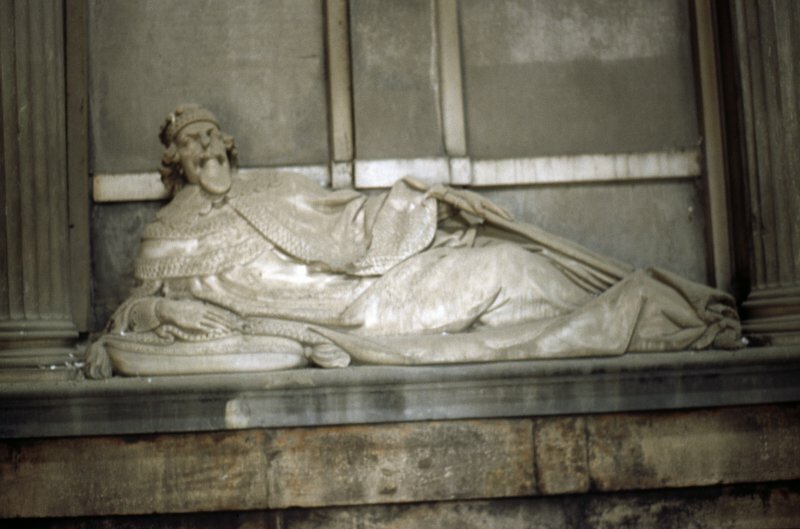 Further alterations were carried out on the church in preparation for Charles l's coronation there in 1633. 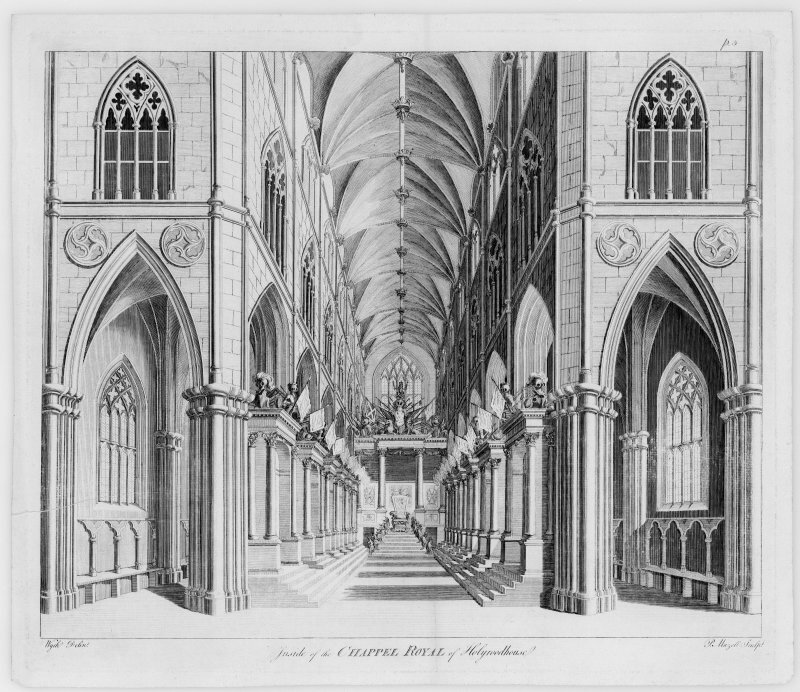 His son, James VII, declared the church a chapel royal and fitted it up as a Catholic place of worship. 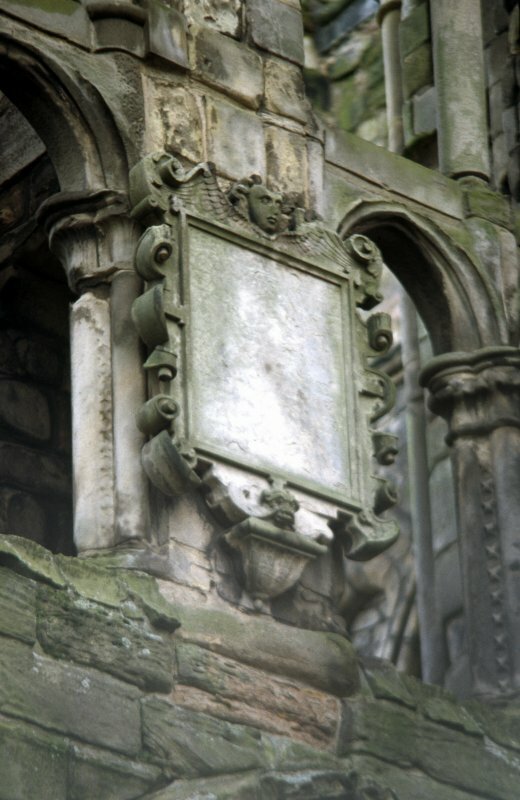 Canongate residents were thus denied the right to worship in their centuries-old parish church. 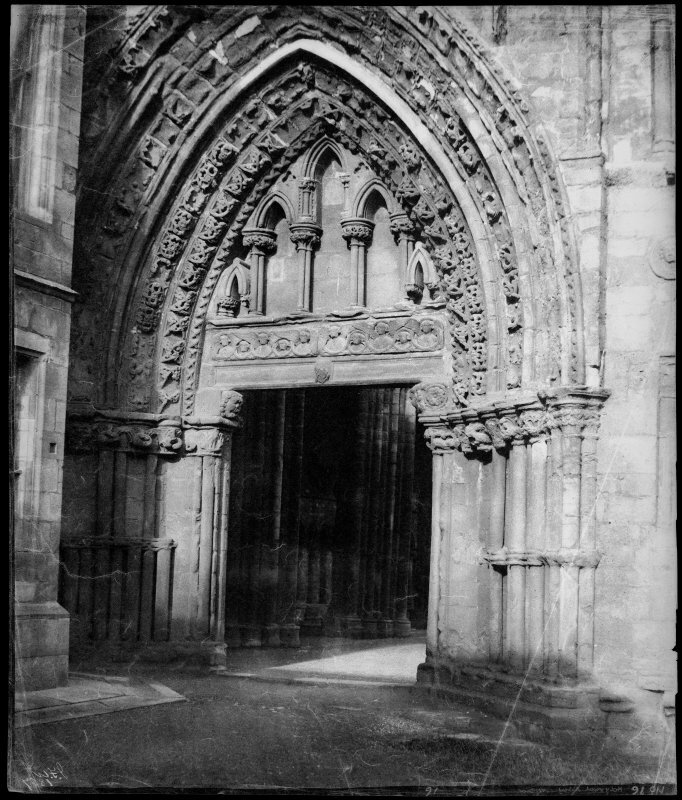 Upon the news of the Glorious Revolution and the fall of James VII, a mob stormed the chapel, destroying every emblem of the Catholic faith as well as desecrating the royal tombs (Bryce, 1914, xliii). 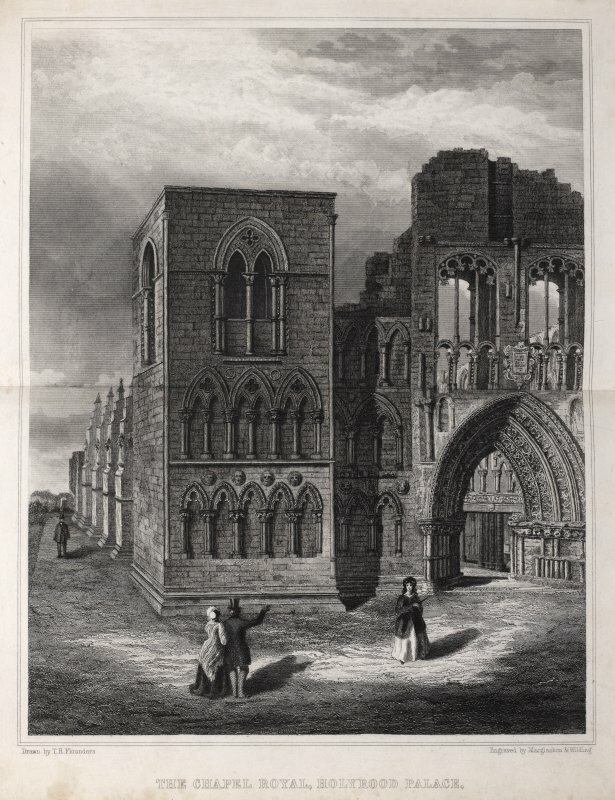 In December 1768, the roof, which had been rebuilt ten years earlier, suddenly gave way bringing down also the clerestory, the roof of the northern aisle and most of the flying arches (Bryce, 1914, .xliv). 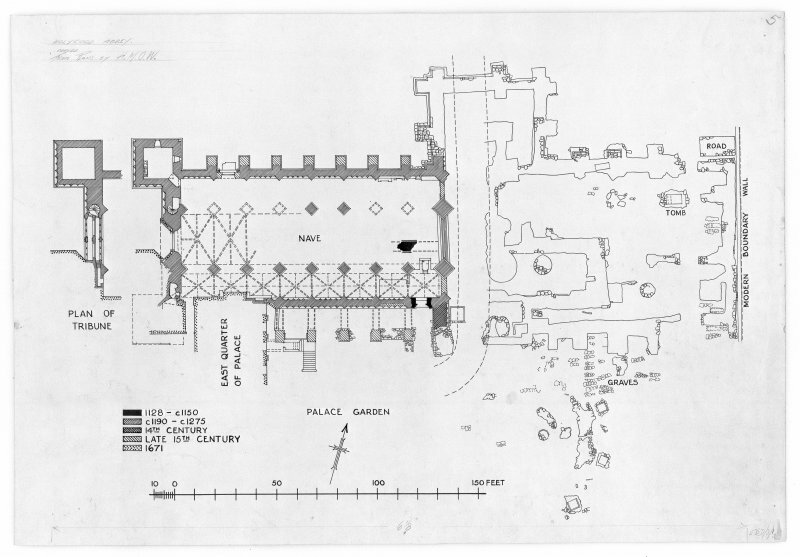 A Desk-Assessment of below Ground Archaeology in the Nave of the Abbey Church focusing on the problem of drainage in the Abbey. NT 2696 7398 An area in the NW corner of the nave was excavated in May and June 2001 to ascertain the nature of the upper deposits and the cause of drainage problems. Features excavated and recorded included gravels, drainage, graves, a medieval deposit and wall foundations. Recommendations were made to alleviate the drainage problems. 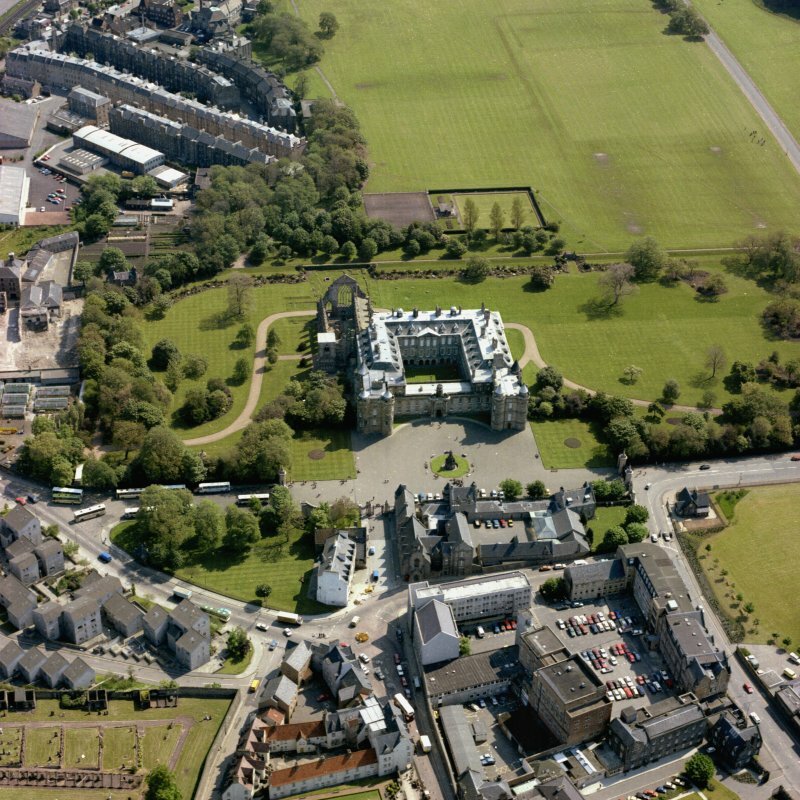 NT 269 739 A watching brief was undertaken in April 2005 during the excavation of extensive trenches in the gardens around the Palace of Holyroodhouse and the abbey. 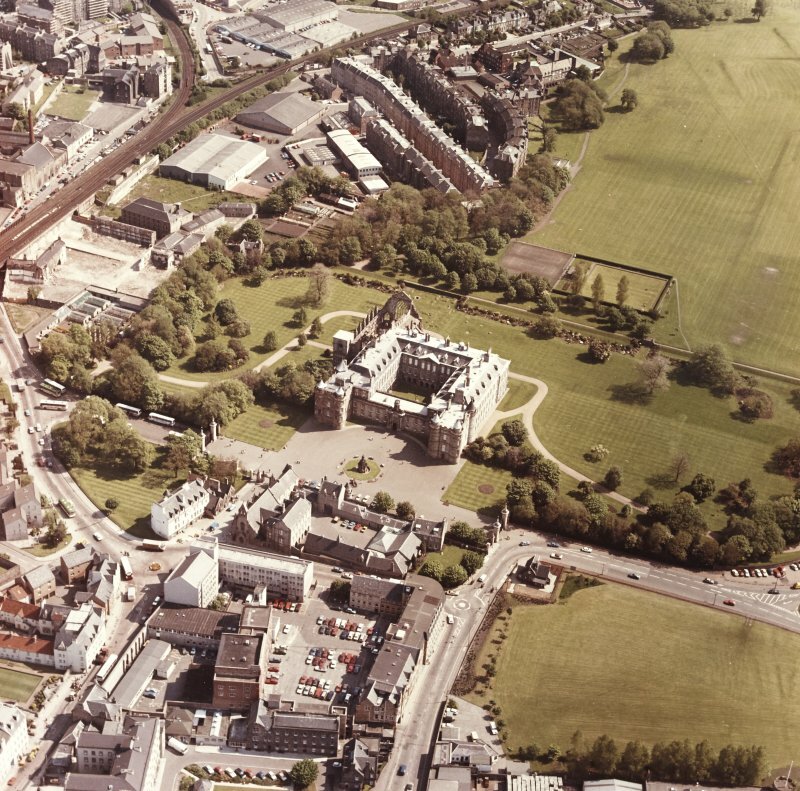 The archaeological potential of these areas was somewhat limited by the extensive landscaping works undertaken in the gardens over the last two centuries, although there was a higher chance of encountering buried features near the ruinous abbey. There were no finds or features of archaeological significance. 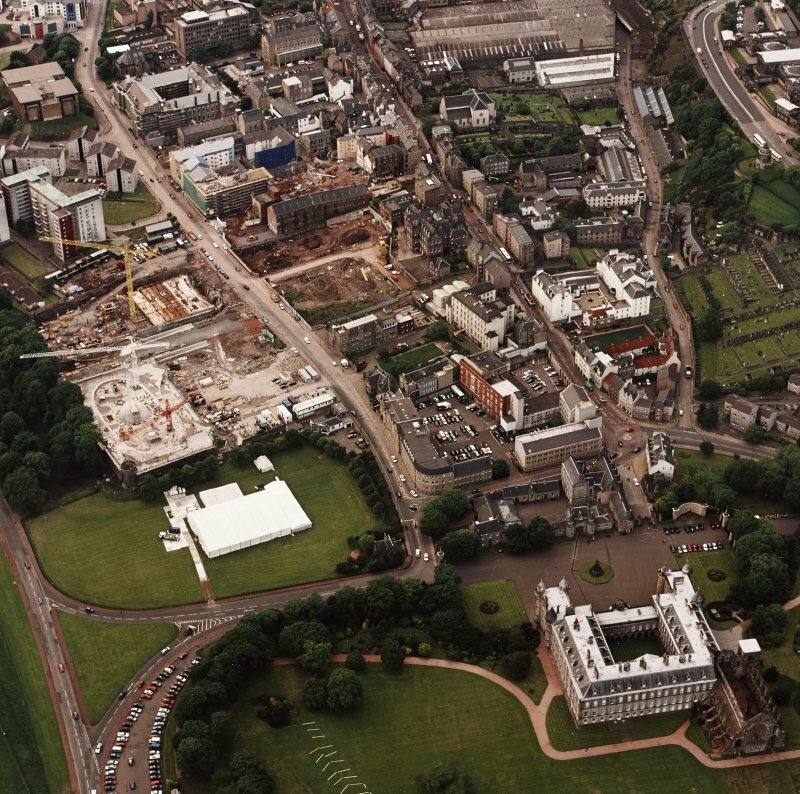 NT 2690 7396 A watching brief was maintained, 22 February–20 March 2008, during the excavation of a service trench running N from the N wall of the Palace of Holyroodhouse past the W end of Holyrood Abbey. The trench followed the line of a previous pipe trench as closely as possible to avoid disturbing any previously unbroken ground. Towards the S end of the trench there was a concentration of human bone in the backfill. 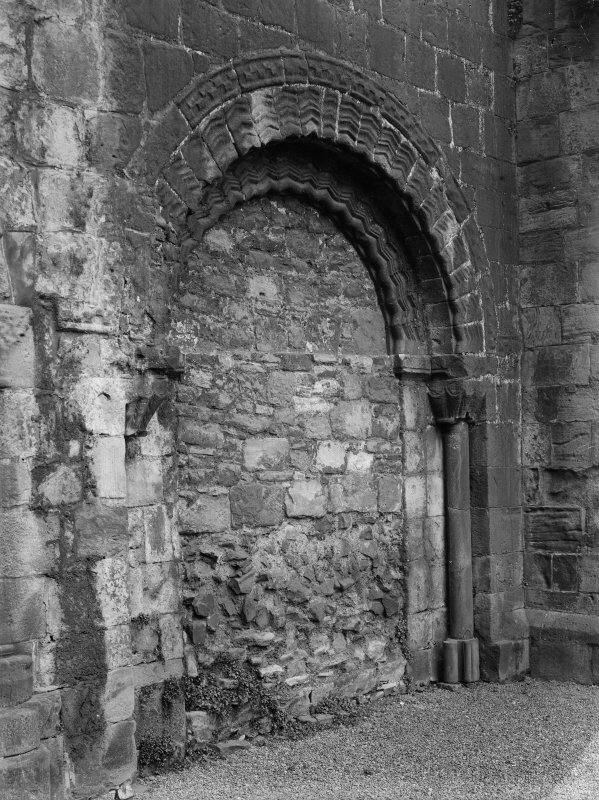 An E–W aligned grave was also recorded at the SW corner of the N tower of the abbey. This burial had been cut through by the earlier pipe trench. It is likely that more than one grave had been cut by the initial pipe trench but only one definite grave was identified with fragments of bone visible in both sides of the trench. 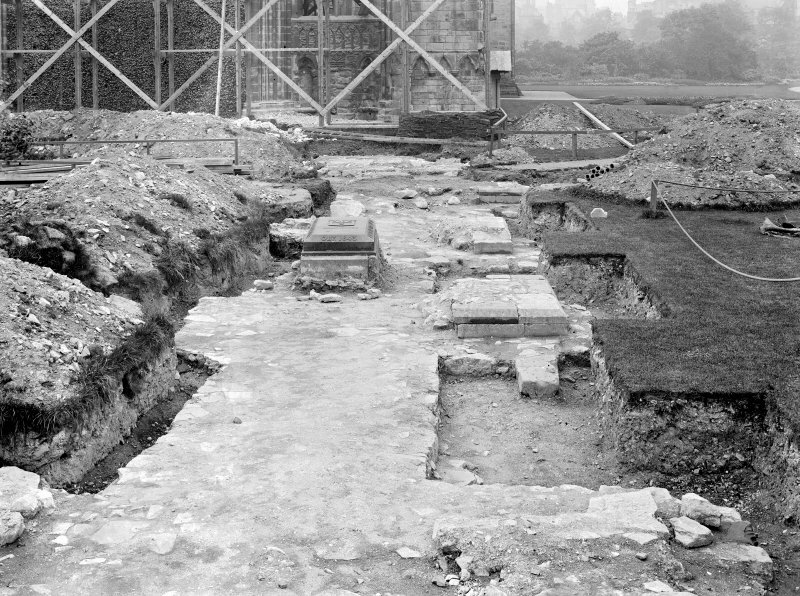 At the SW corner of the N corner tower an area of concrete was revealed below the foundations which may represent a repair to the corner of the foundations of the N corner tower. 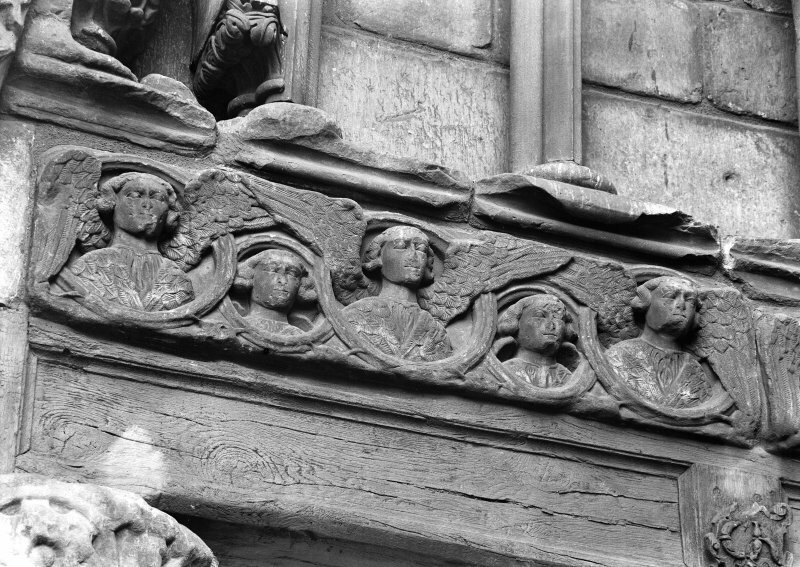 NT 26940 73964 The most interesting stones in this collection are the late medieval tomb-slabs, and although some are very weathered, some well executed details remain on others. HOL/ts/1a+b forms the top left hand and right hand corners of an incised slab. 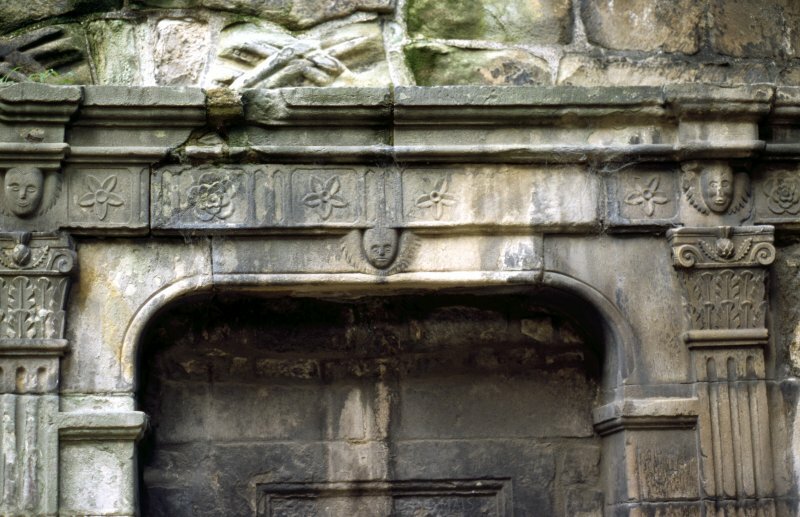 This would have belonged to a churchman, with the remains of a cross-head, together with a chalice and a shield containing three fleurs-de-lis(?). 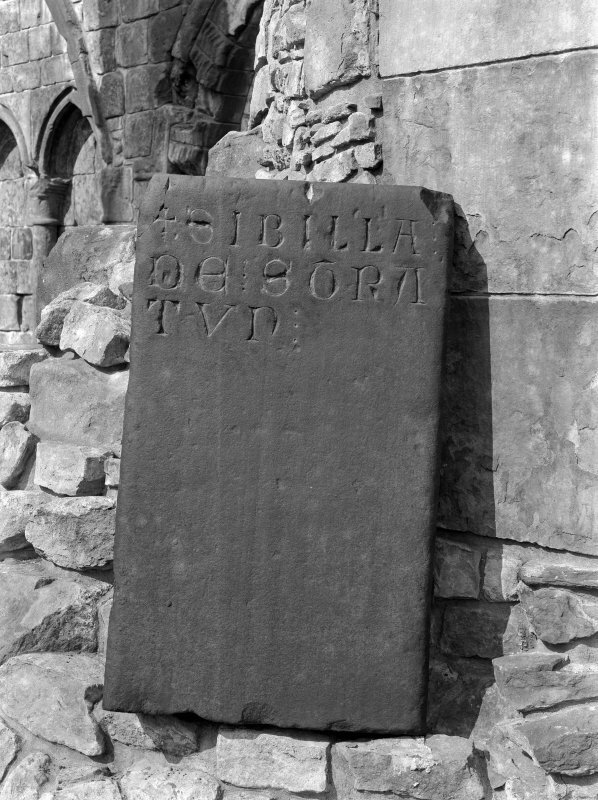 The identity of the individual is unknown, as an inscription running around the outer edge is illegible. The upper part of another slab is found in a pair of stones, HOL/ts/6-7. 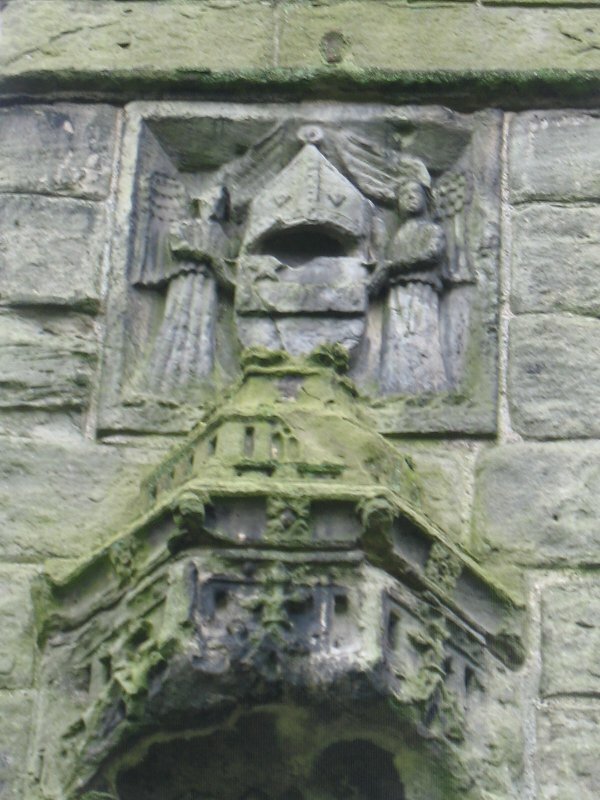 Together, the late medieval fragments depict a tree set above a shield of arms. The quartered shield bears three florettes and a ship. The shield has a crown above and is flanked by a pair of stags, each of which wears a harness, the lower ends of which entwine in a decorative knot below the shield.